It’s been a while since I’ve done regular blog posts. 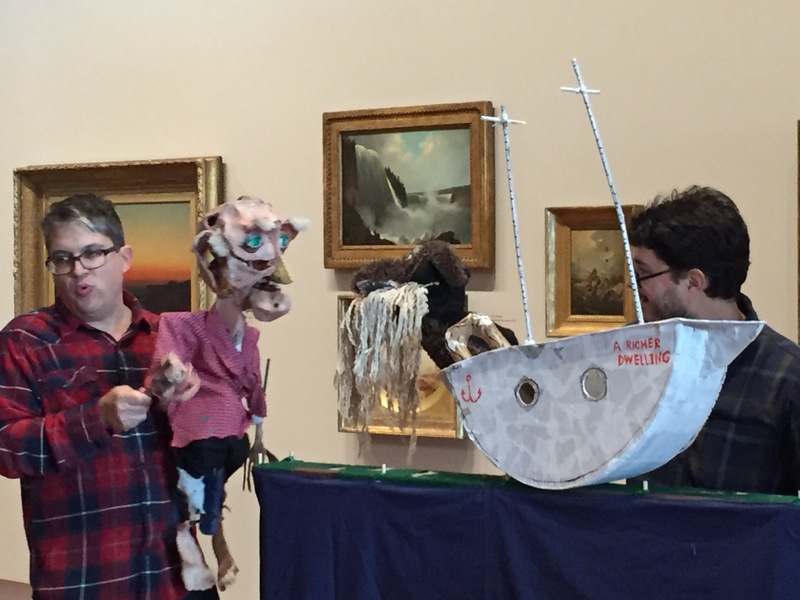 Here are some images from a November 2018 puppet show at the Westmoreland Museum of American Art. 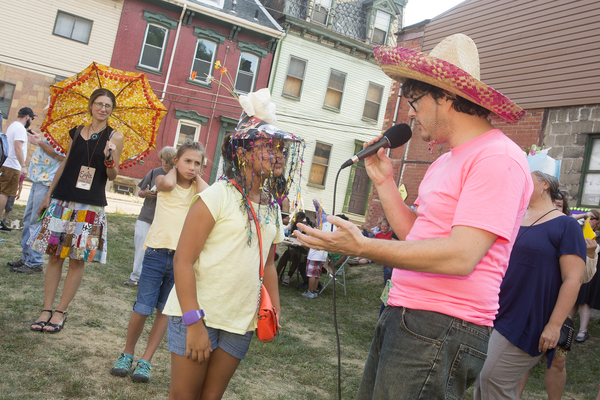 Mike Cuccaro and I developed a series of shows about the Pittsburgh folk legend, Joe Magarac. 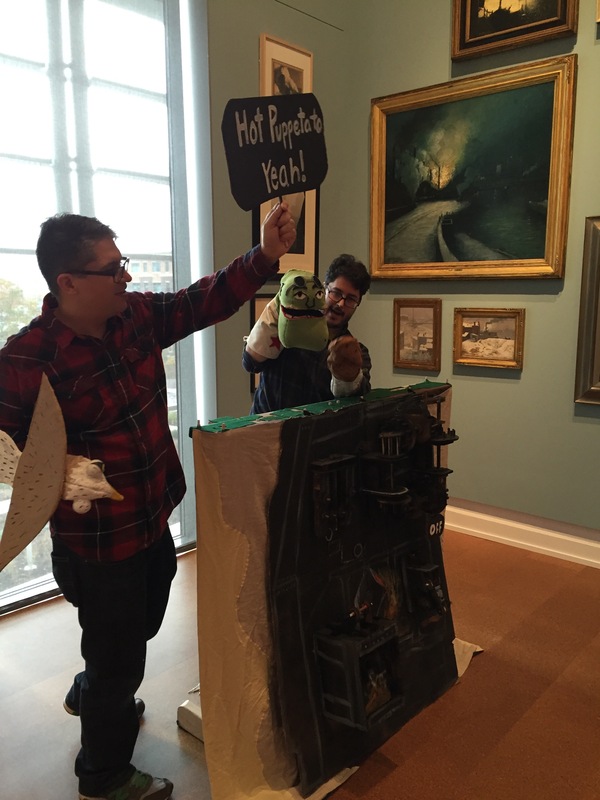 We wrote a script, crafted puppets and then built three shows to perform in various galleries of the museum. 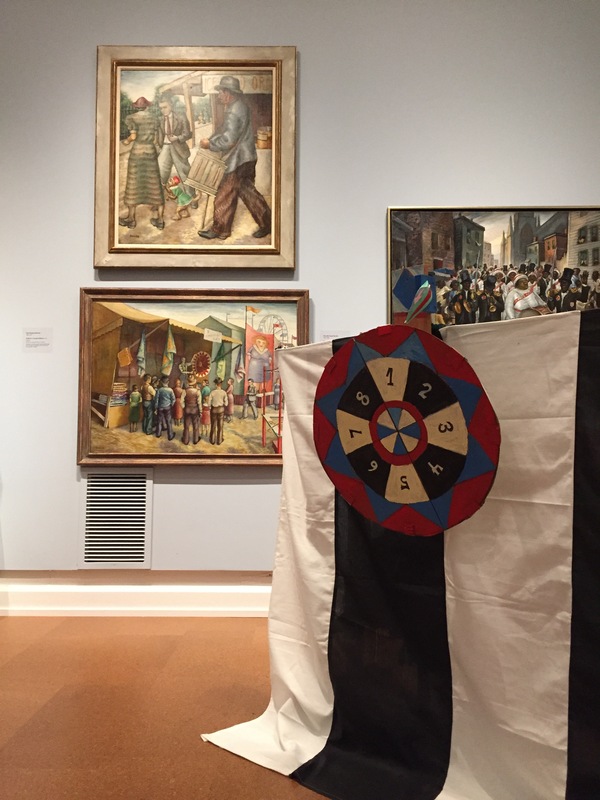 We adapted a variety of Magarac legends, weaving in content from the works in the Westmoreland collection. 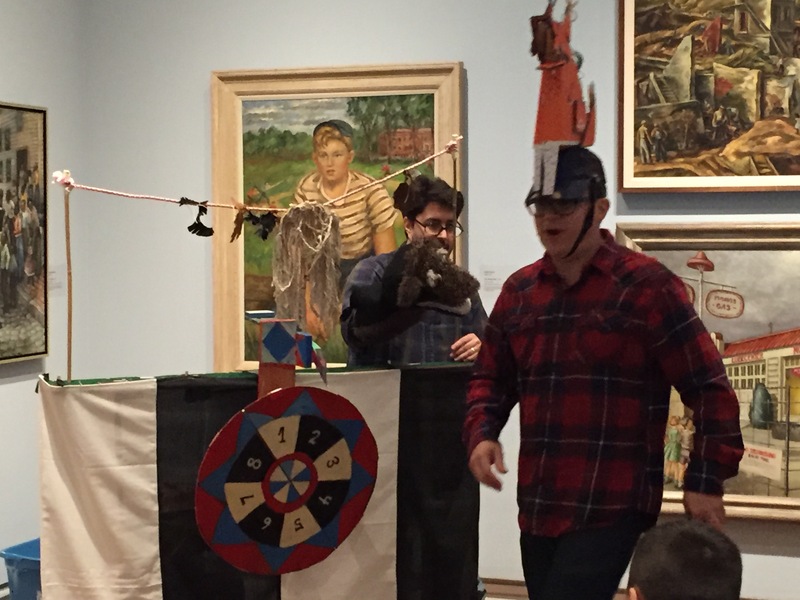 The shows were played throughout the day on the museum’s Family Day. Legendary steel man Joe Magarac could bend hot steel with his hands. Joe Magarac and Newsie Ned. Photo by Larry Rippel. Mike Cuccaro sings the Joe Magarac Song to open Part II of our show. Joe works 24 hours a day, doing shifts in the Homestead, Monessen and Braddock steel mills. Homestead Harry, lifting a 500 pound dolly bar. Photo by Larry Rippel. Getting ready to start Part I of the puppet show. 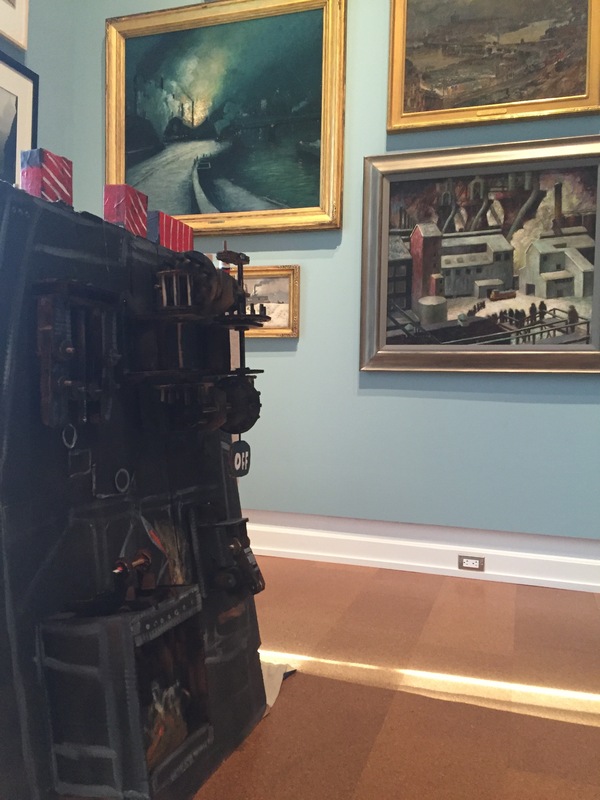 A wheeled stage made it easy to move the show to various galleries of the museum. In the final act of the production, Joe Magarac falls into a vat of hot steel, and is then poured into steel beams used for the creation of a new bridge. In this scene Joe has become the bridge. Part I, Newsie Ned comments on a contest of competing steel workers at their annual Kennywood Picnic. Interior of final installation: The Box or Finding Common Ground in a Complex Galaxy. 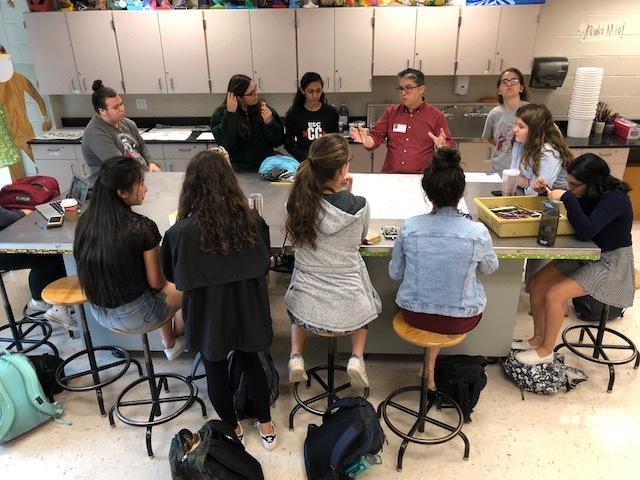 This May I spent thirteen days at Upper St Clair High School as resident artist. 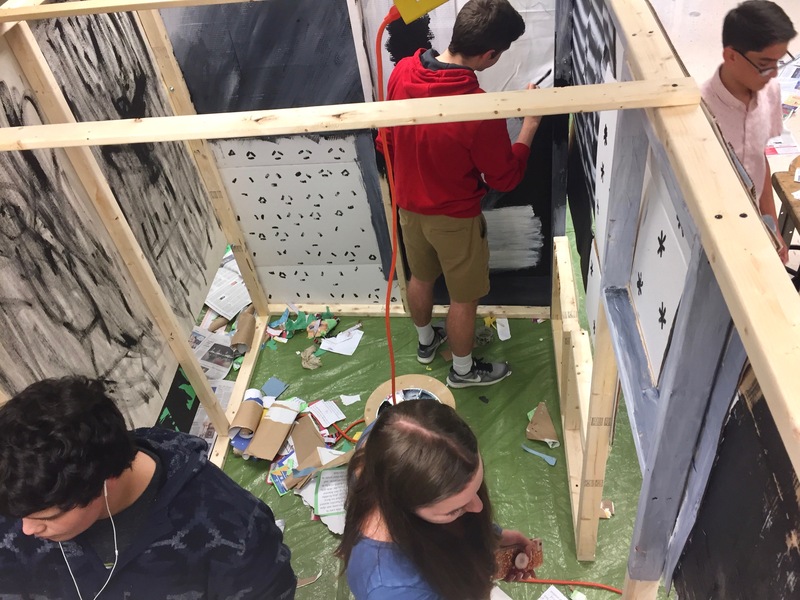 I spent two weeks with a core group of around forty students (and two very supportive art teachers) to develop and create a public work for the school. 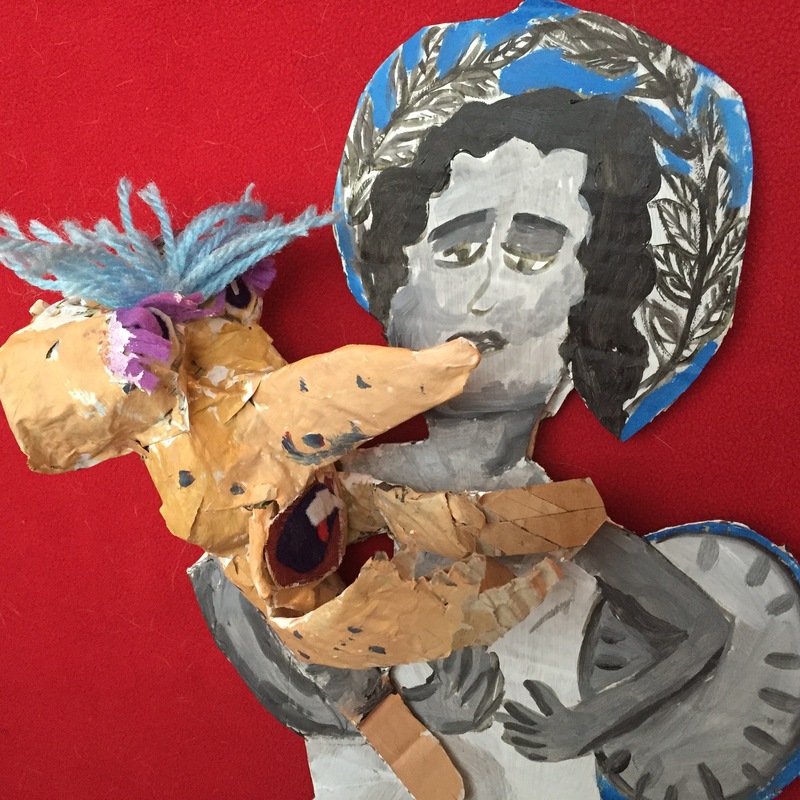 I then spent three days visiting classrooms to provide an arts experience for all tenth graders. I generally compose residency plans after meeting with school administrators and representatives from the PF/PCA Artists in Schools & Communities program. Although I design lesson plans in advance, my school residency projects are largely student-driven. I facilitate a process that involves learning, experimentation, brainstorming, decision-making, planning and implementation of a project. This is a lot to accomplish in ten days with a core group. 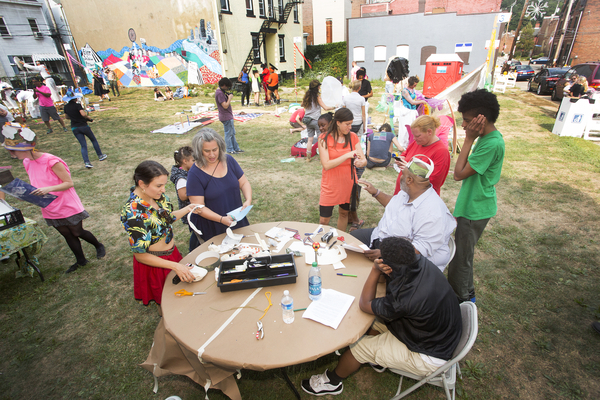 Regardless of the final outcome, the rigorous pace gives participants experience in being part of a collaborative project. Compromise, delegation of tasks and teamwork are essential. The project was broken down into one week of research and exploration followed by one week of construction and placement of an installation. This schedule allowed us to figure out ideas that we wanted to express in the work. It also gave all participants a chance to express their ideas. 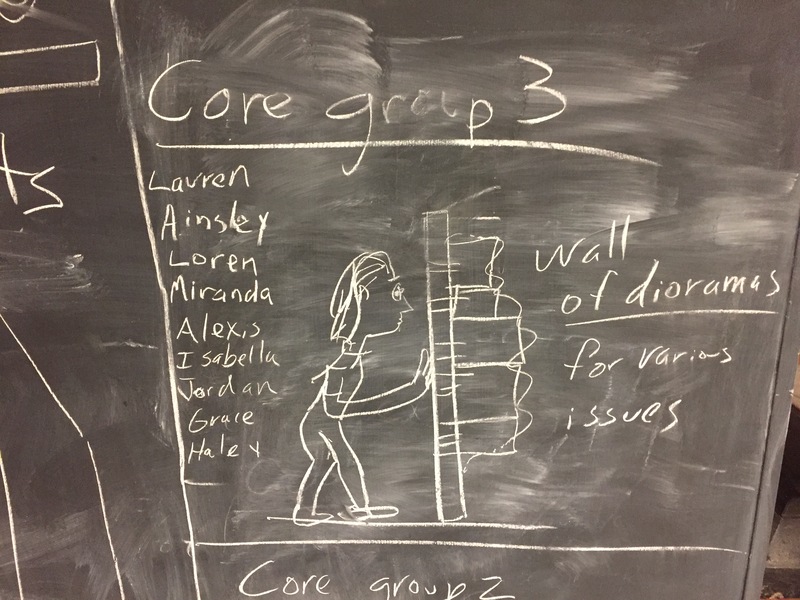 The core group project began with the goal of developing a student-informed project that would express themes of empathy and understanding. I began by giving the students a presentation of my work, emphasizing the various forms that art can take. 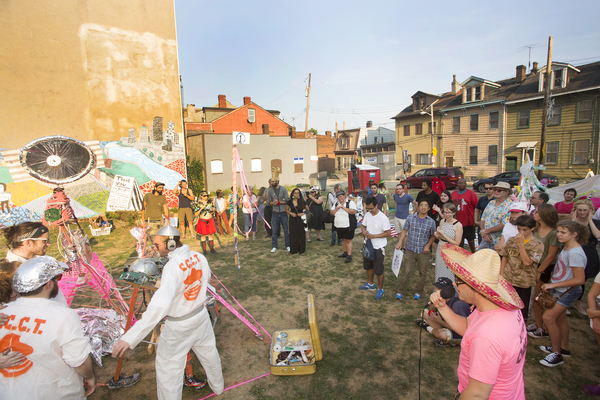 These included site-specific installation, public art events, social projects and performance art. 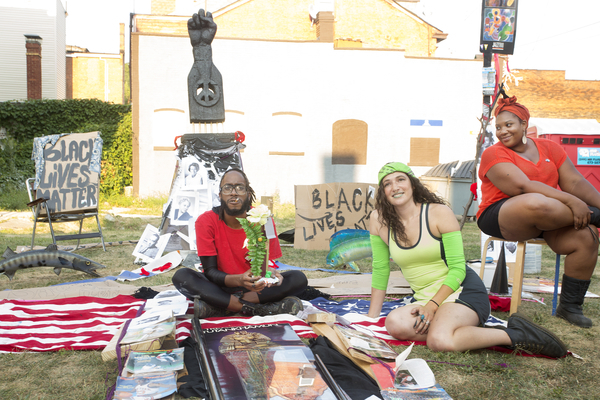 On day two, core groups viewed a presentation of works by contemporary artists addressing social issues. 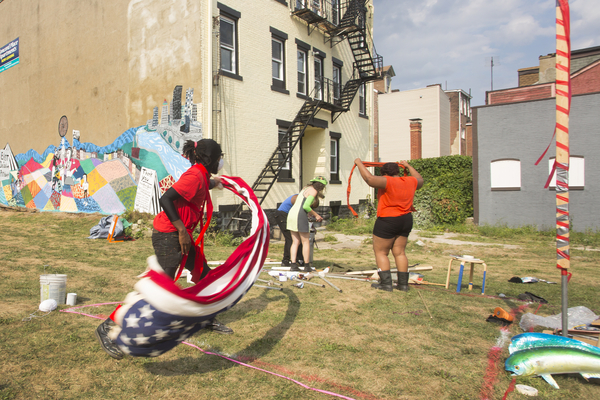 We looked at how Pedro Reyes addresses gun violence through projects that transform guns into musical instruments and gardening shovels. We looked at the work of Chinese artist Ai Weiwei and discussed his messages of freedom, justice and equality. After the presentation and discussion, participants were given a survey asking them to describe issues that they feel strongly about and to suggest ideas for a collaborative project. We wrapped up with each student sharing an idea from their survey. Our initial discussions and survey revealed a wide variety of interests and ideas. On the third meeting we looked a compilation of our collective concerns including equality, mental health and the environment. Our investigations into the motivations for art making made for some interesting philosophical discussion. 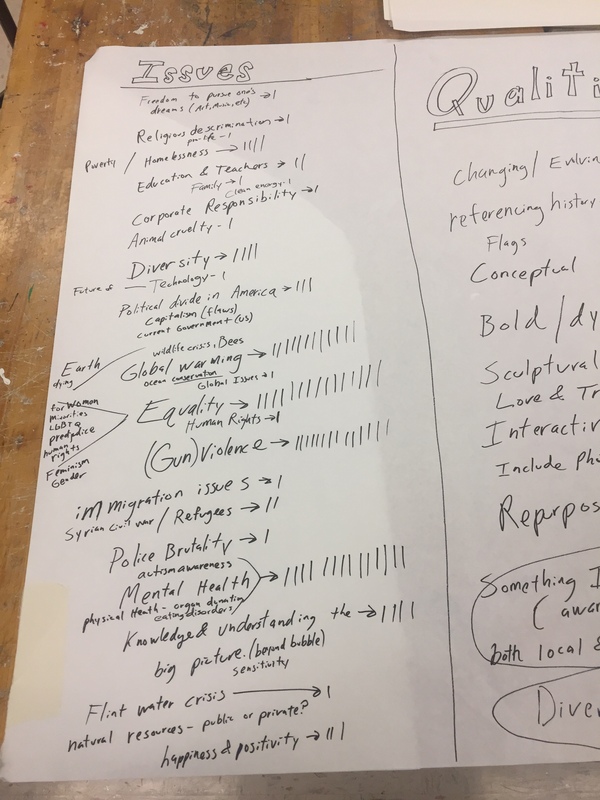 A student survey with sketches. Day three transitioned into an exercise in voicing our ideas through text-based art. 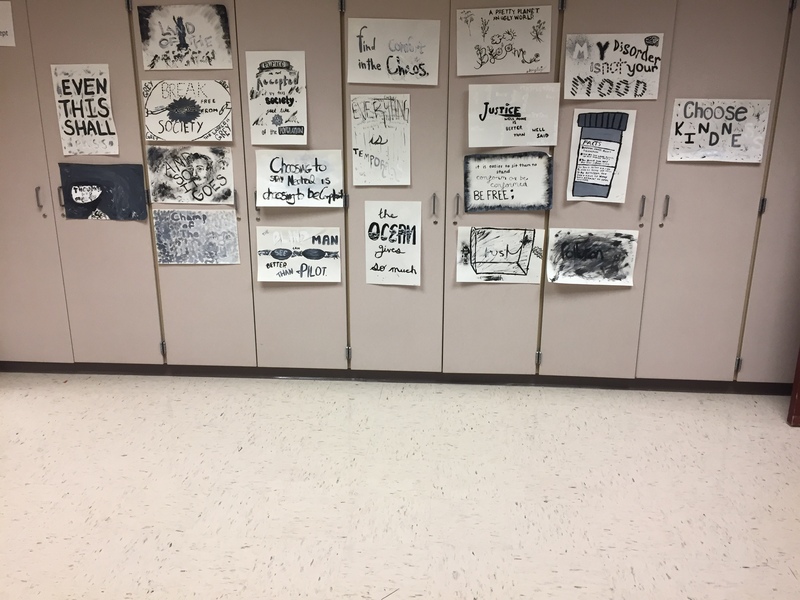 After looking at examples by Barbara Kruger, Glen Ligon, Vanessa German and Bruce Nauman, each participant created their own text-based work in black and white acrylic on paper. Some of the challenges of the exercise were 1. Trying to present a clear message. 2. Thinking outside of one’s own knowledge and experience to create a piece that exhibits understanding and empathy. 3. Keeping the works creative. After works were completed, we arranged them in a school hallway and had a critique. Some of the text-based exercises were later attached to our final installation. To refocus the core group, a collage exercise scheduled for the fourth day was changed to an exercise in manifesto-writing. Through debate and conversation, we realized that the core group was interested in a variety of issues. 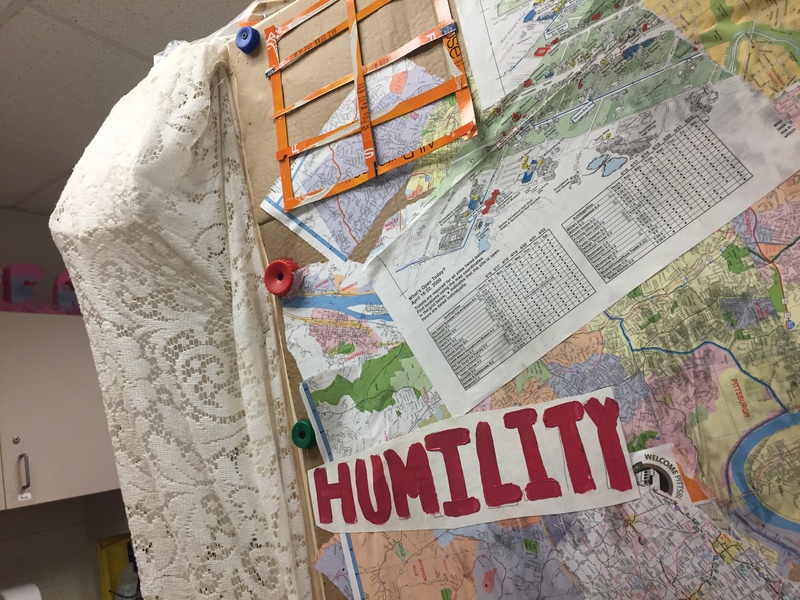 There was a strong interest in thinking outside of the school district, to have understanding of those living elsewhere. 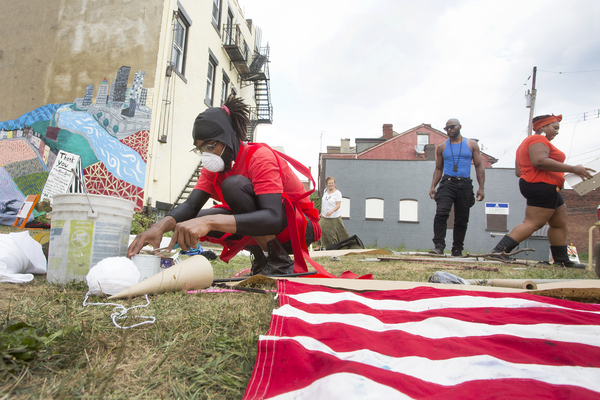 Freedom of speech and expression was also a core value that the group wanted to express. Students spoke of the difficulties in speaking their mind concerning political and social issues. 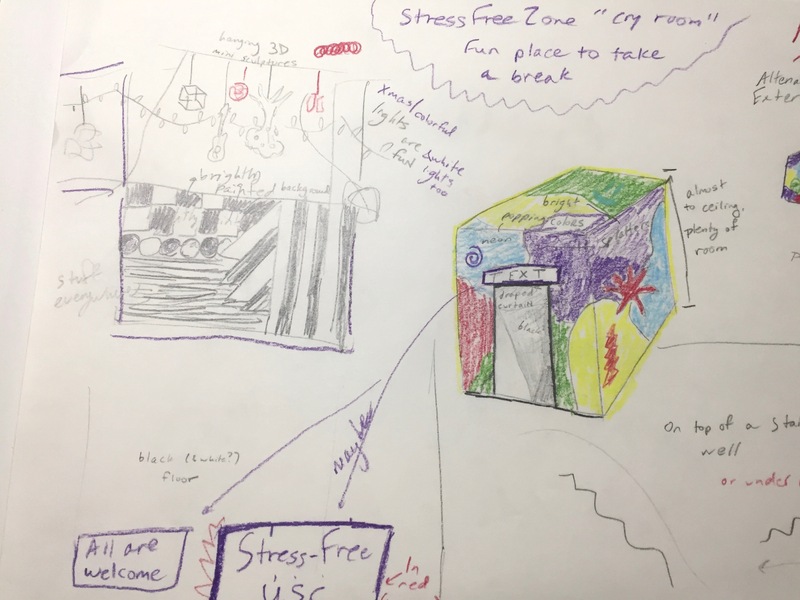 We agreed that celebrating the complexity and uniqueness of each student was important and despite our differences, we could find common ground in work of creative expression. A student sketch for a dress form. Dress installed in front of final installation. On the fifth day we narrowed down our idea sketches into three ideas including a free-standing sculptural piece, a collection of thematic works and an immersive room containing focused areas of activity. A room or box-like form was voted on. We then began to sketch some variations of the idea and to prepare a list of materials. Wood and hardware was needed for the structure. 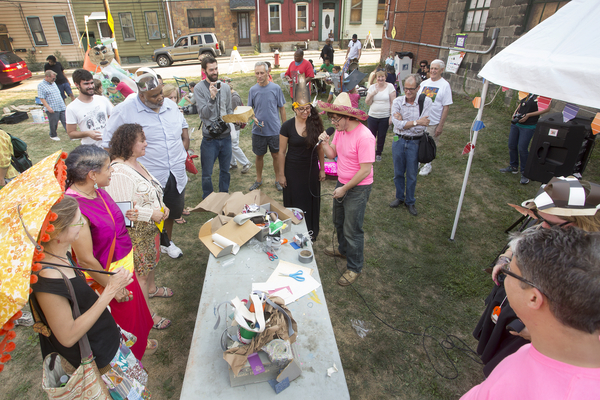 The students agreed that repurposing materials was important, so I arranged to pick up a carload of materials from Pittsburgh Center for Creative Re-use. Student sketches for box installation. Monday of the second week began with loading in materials and nervously anticipating where the project could be placed. 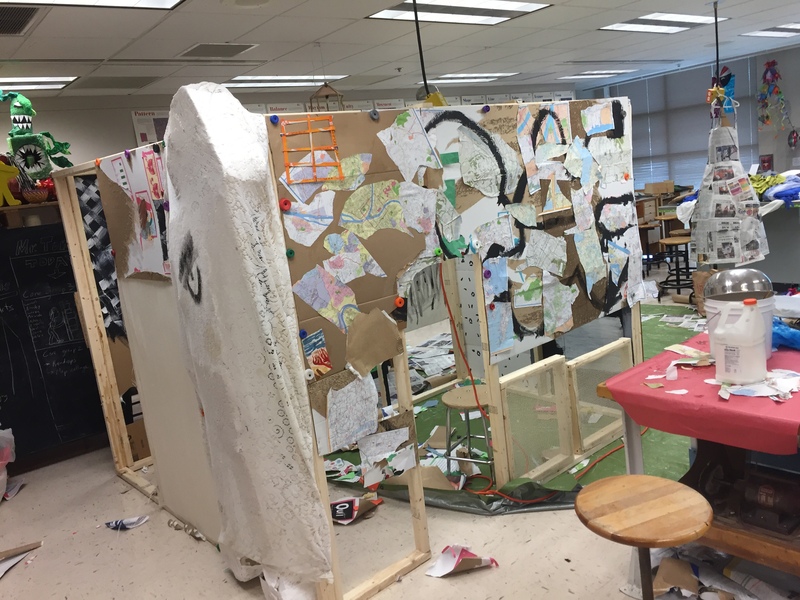 The students wanted the work to be located in a visible public space in the school. The art teachers were very helpful in getting approval to place the work in the school lobby. 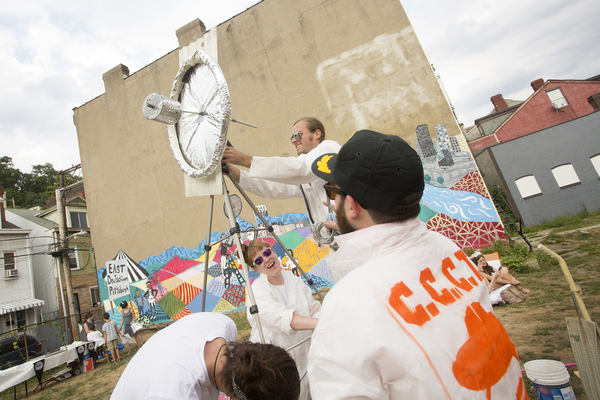 Within the core group, teams worked on various components of the installation. One group worked on an arrangement of cardboard raindrops, laser cut and suspended from the installation ceiling with fishing line. Each drop was embellished with a message. 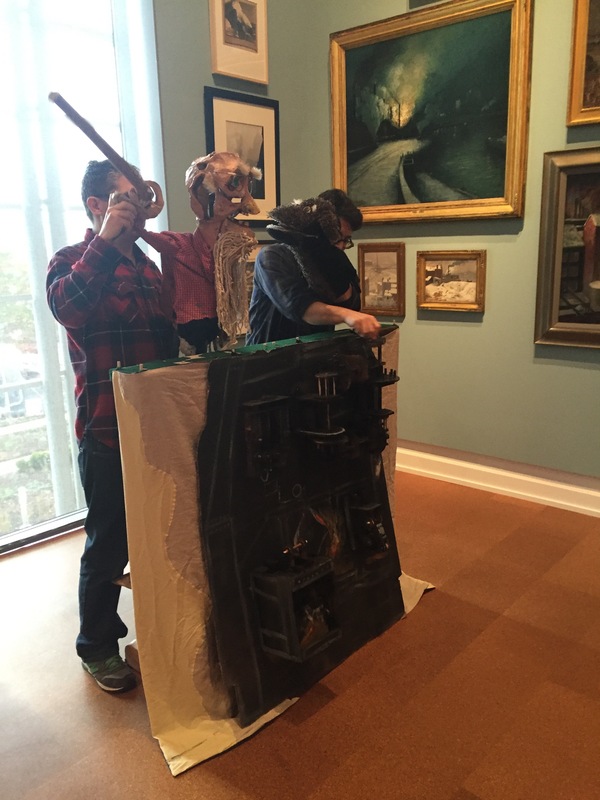 Another group worked on small dioramas, viewable through small holes in one wall of the installation. 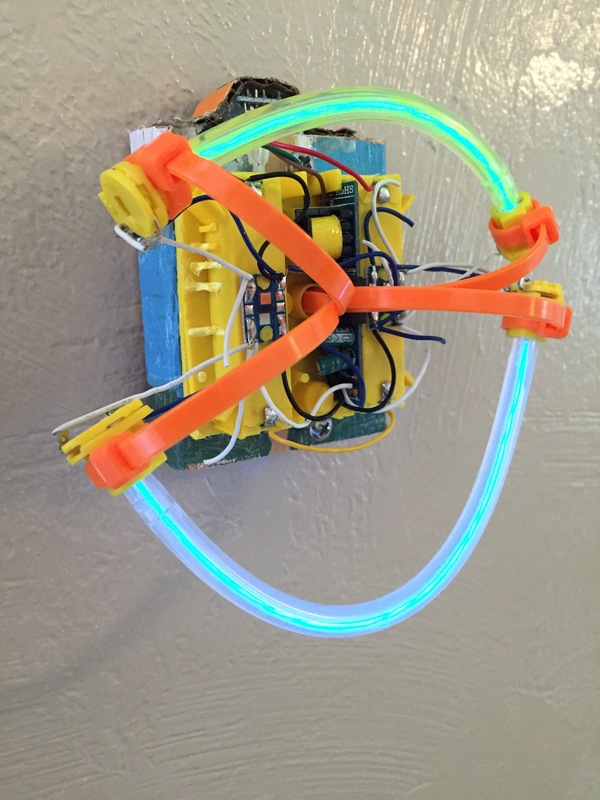 A third group worked on mobiles and small sculpture to be located within the main room of the installation. 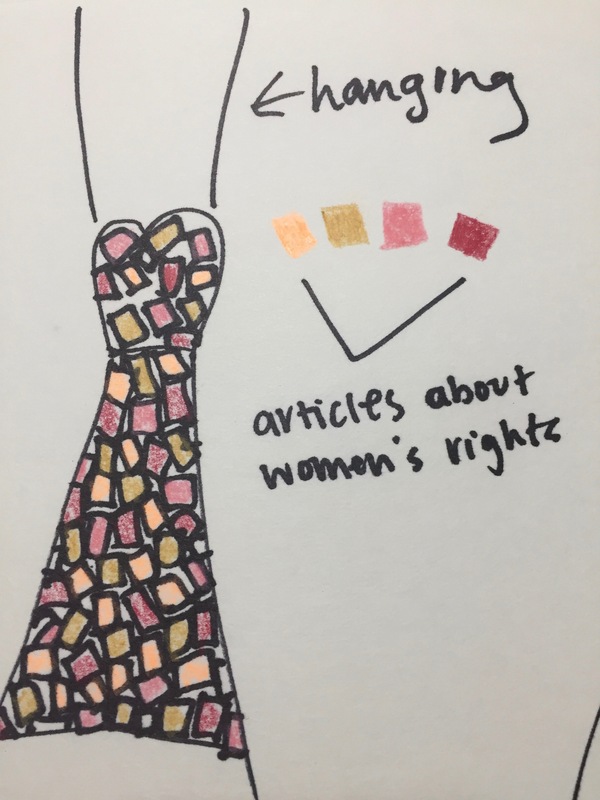 One of these works, a life-size dress form sculpture expressing ideas concerning woman’s rights and equality was eventually suspended in front of the installation. Sketch for dioramas viewable through holes. 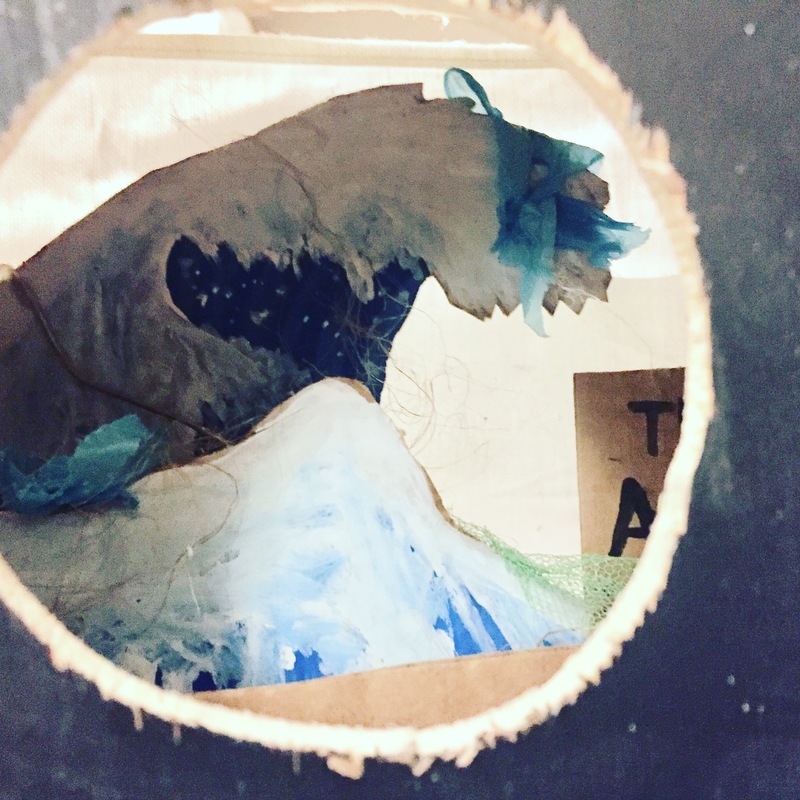 Looking into one of the holes reveals a famous wave covered in plastic debris. 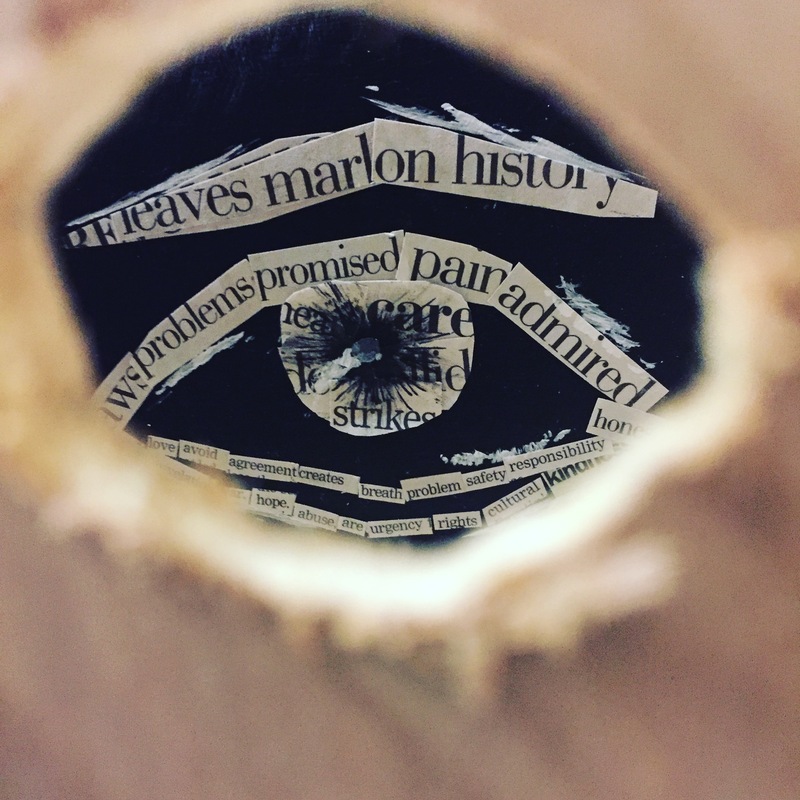 Another hole reveals an eye made of collage text. 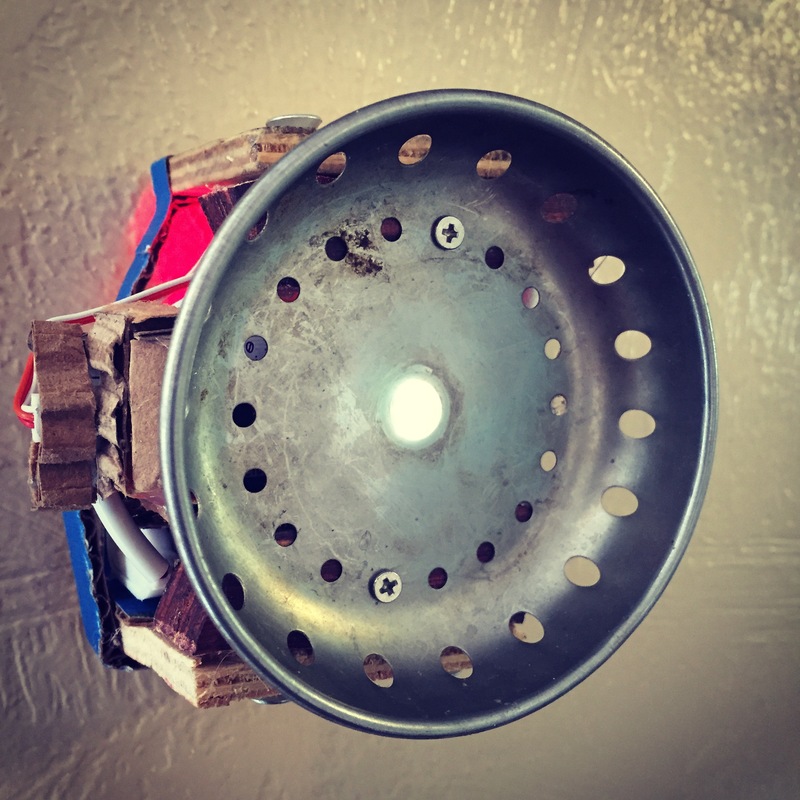 As teams worked, I quickly framed in the box shape with wood and assisted with connecting the various components. 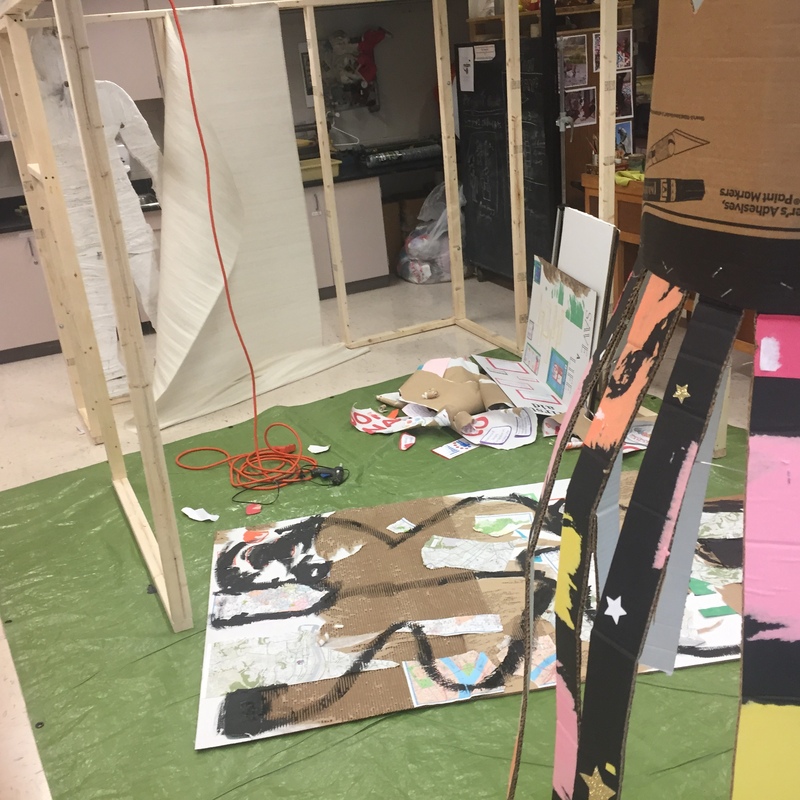 Walls were created from repurposed cardboard and fabric. Some students worked on painting interior areas. 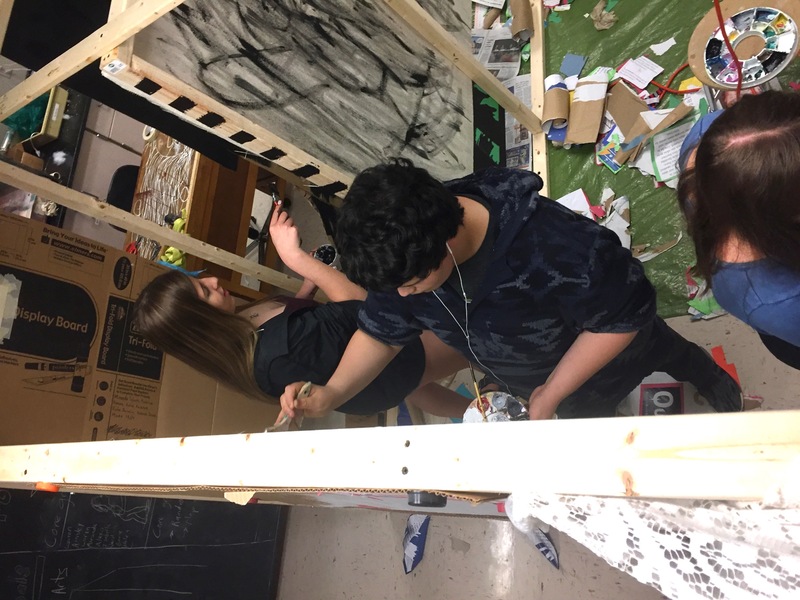 Students working on the interior. The exterior of the installation was covered with pieces of torn maps, making the final work look like a globe pounded into a cube. At final installation various text-art pieces were attached and collaged onto the work. 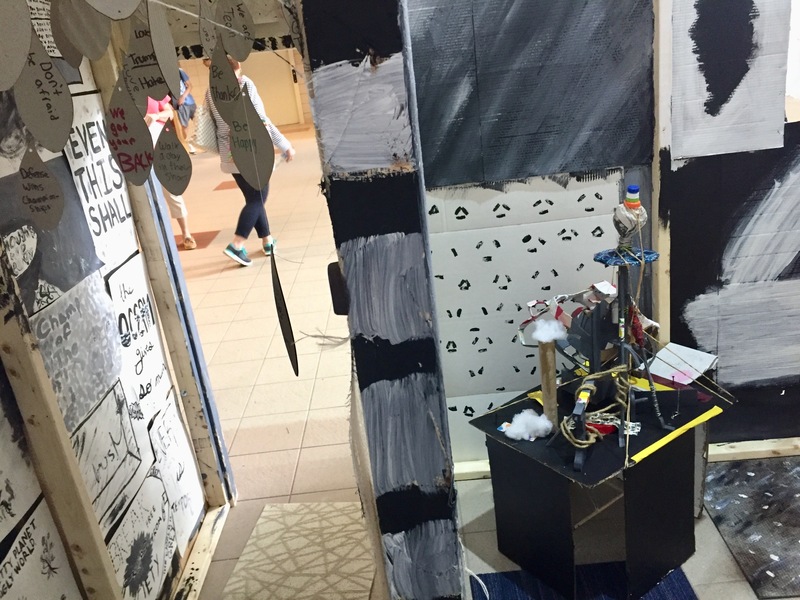 Two doors and compact space gave the installation a maze-like feel. Art teacher Robyn Smigel assisting with installation. A student painting on the interior. Plastic jellyfish dangled from the ceiling. Making a statement with dolls. 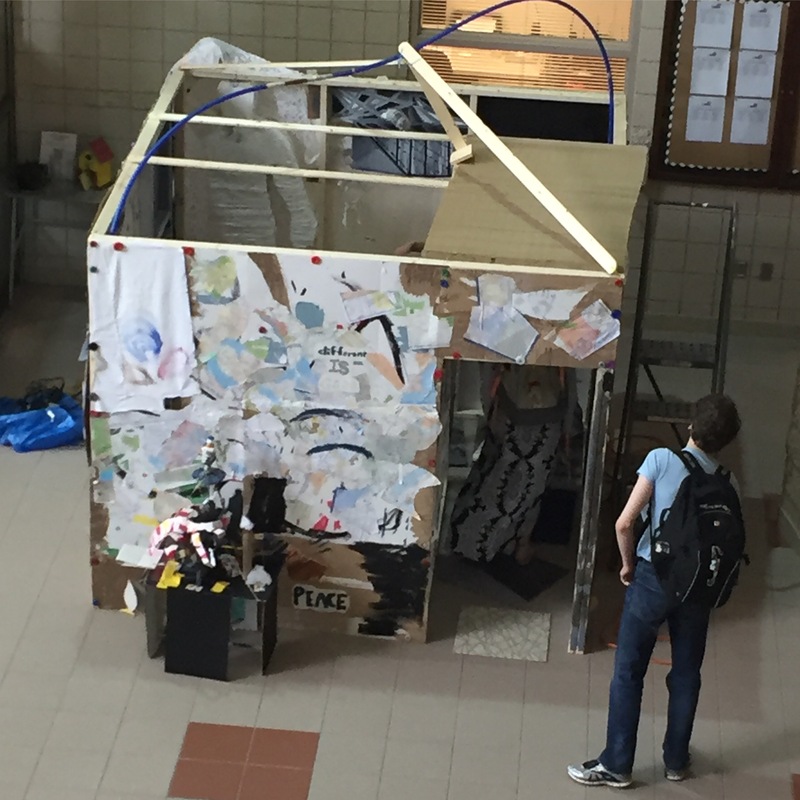 The project THE BOX or Finding Common Ground in a Complex Galaxy, opened in the main lobby of the school. A giant hand-made artwork in the midst of a grand institutional entry, the work immediately attracted attention. Some noticed the messages and were excited. Some were confused that their daily surroundings were altered. Some were curious and wanted to explore the inside of the creation. During reflection with students at the completion of the installation, some expressed the difficulties in working on something so abstract over such a short time span. Not everything worked out as planned. Some were unsure of the rough aesthetic. Overall, I think all were involved in a thought-provoking process. All were challenged to think about art in new ways. A student stops to check out the work as it is being installed in the lobby. 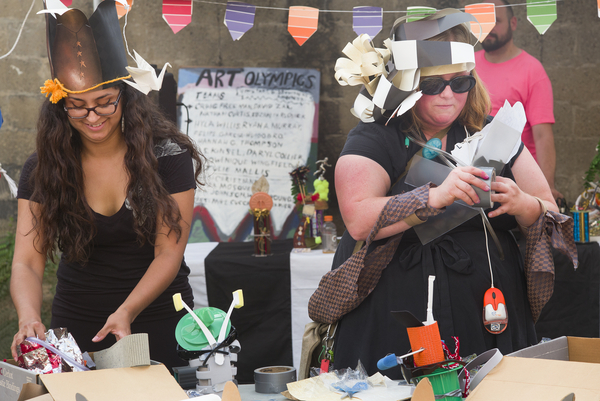 Teams & Judges Announced for September 17th Art Olympics. 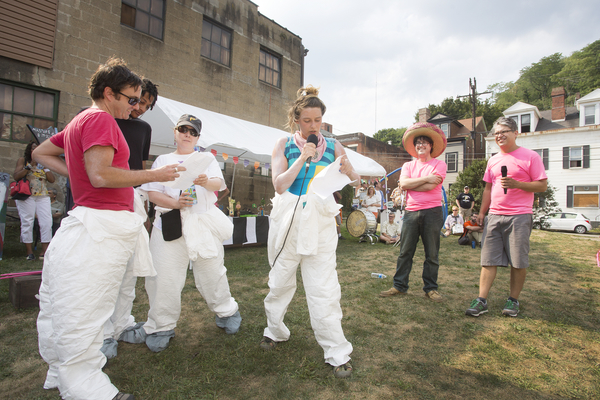 It’s going to be an interdisciplinary arts showdown on Saturday September 17th in Downtown Pittsburgh as three teams of Pittsburgh artists representing a wide range of creative practices face off in a two-hour art-making challenge. 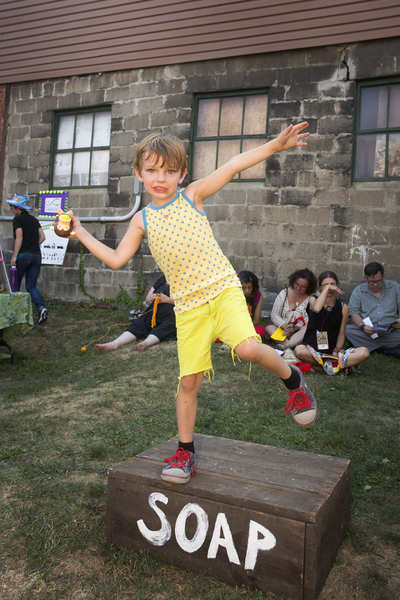 Art Olympics begins with an opening ceremony at 6 PM at the Re:NEW Festival’s 623 Smithfield Street location. The teams will begin building at 6:30 PM and work for two hours. The winning team will be announced just before 9 PM. The event is free and open to the public. 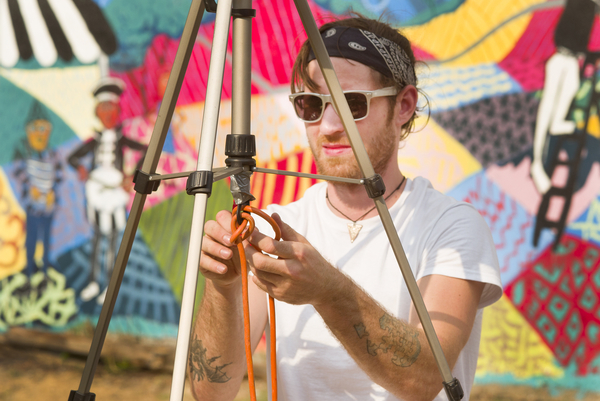 Team leader Sam Turich has a background in film and theater. He will be joined by teammates Alisha Wormsley, Derek Reese and Gab Cody. 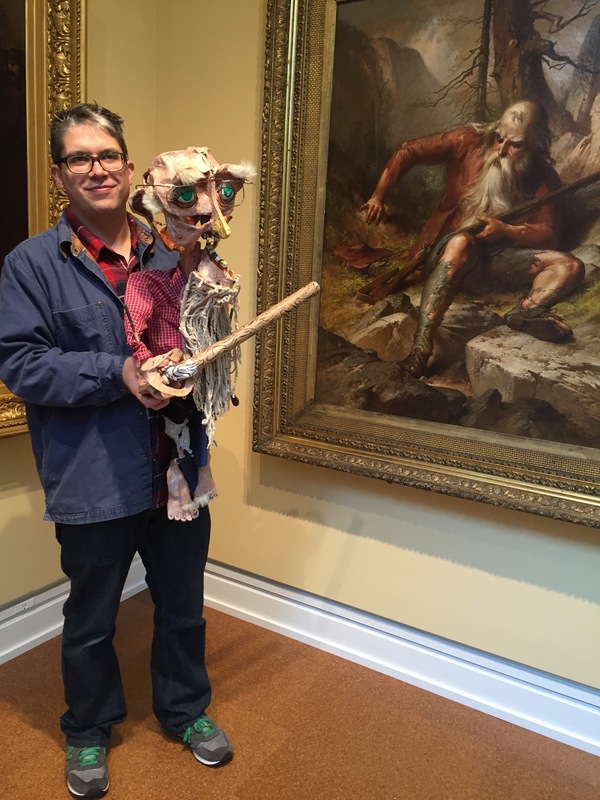 Team leader Ryder Henry is a painter and visionary model builder. His team includes Kate Bechak, Jen Bechak and Nick Falwell. 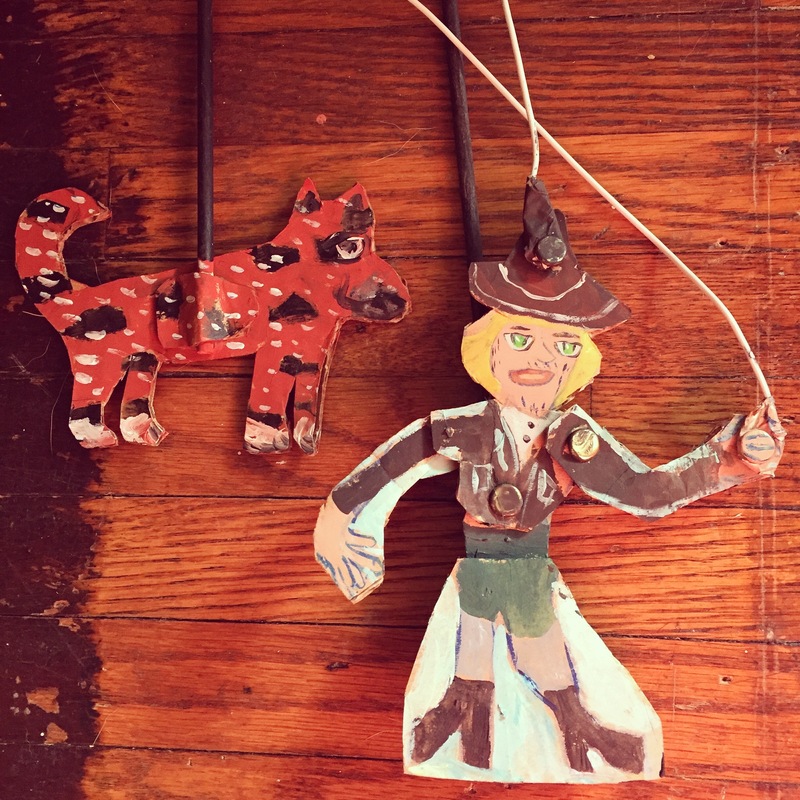 Team leader Audra Clayton is a clay artist / educator. Her team will include Ryan McCormick, Christopher Wright and Kara Zuzu. 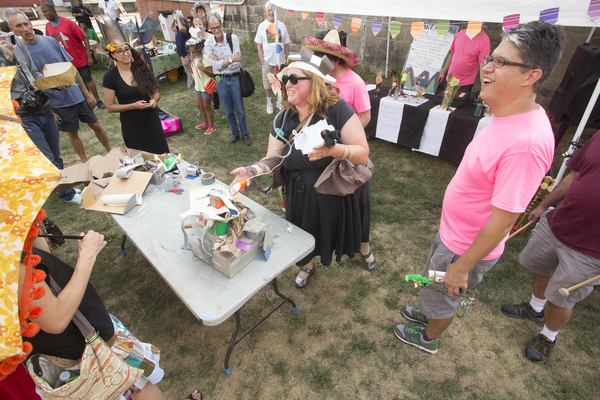 Judges will include art critic Graham Shearing, Gwen Bowman of Pittsburgh Puppet Works, artist Travis Mitzel and Diana Shark of Goodwill Industries. Emcees for the event are Tom Sarver and Mike Cuccaro, with deejay Dave Zak spinning the tunes. 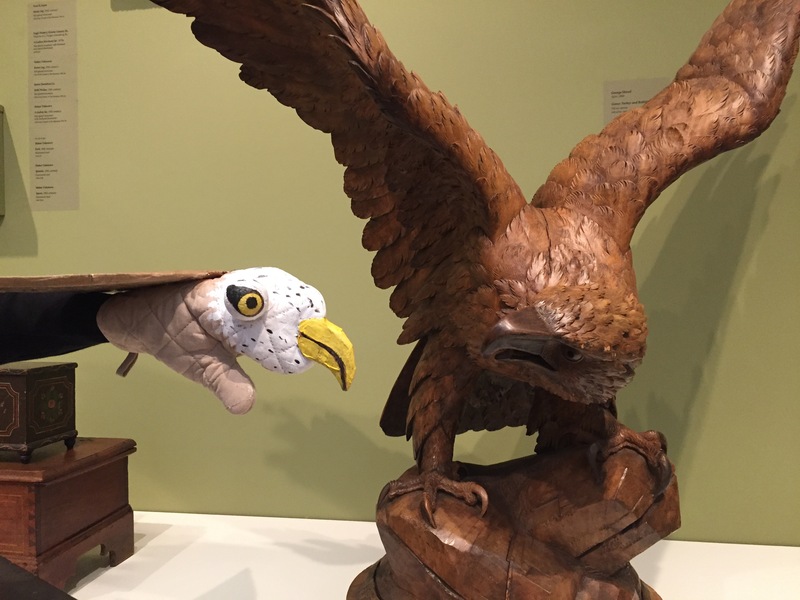 The Westmoreland Museum of American Art, located in Downtown Greensburg, Pennsylvania opened its spectacular, newly renovated museum to the public on Sunday, October 25th, 2015. The Westmoreland has nearly doubled its exhibition space, part of which is a massive cantilever wing walled with windows at its farthest end. 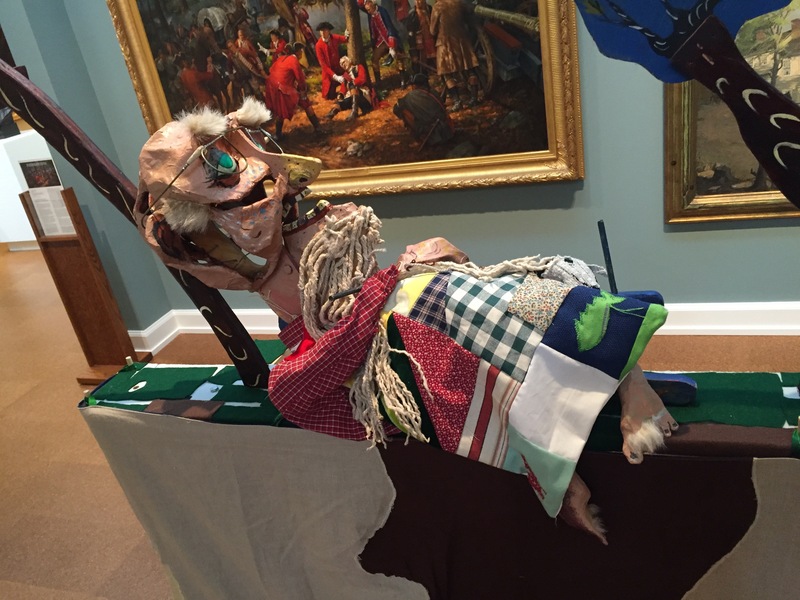 The museum has a great variety of historical painting, folk art, bronze sculpture and work by self-taught artists. 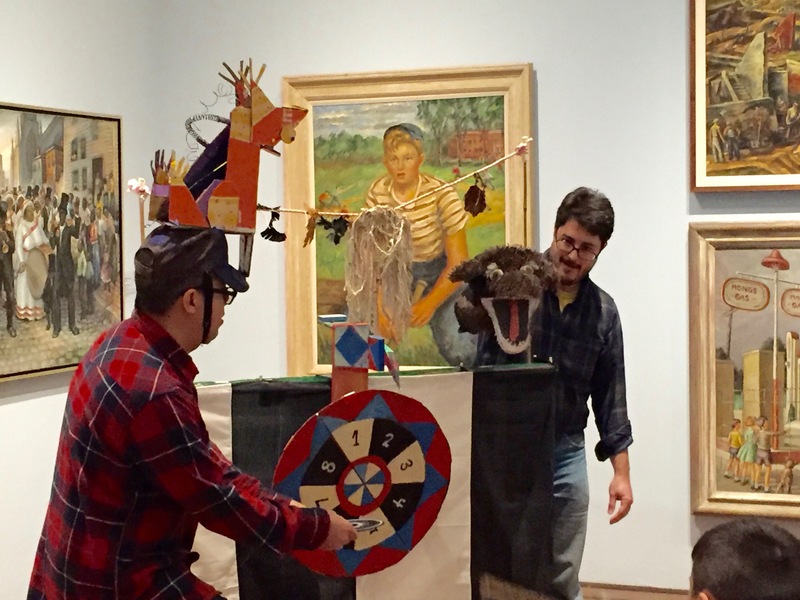 Mike Cuccaro and I were commissioned to create a series of four puppet shows inspired by the museum collection to present at the public opening. The shows were based on the popular Washington Irving character Rip Van Winkle, featured in a prominent museum oil paining by George Frederick Bensell. 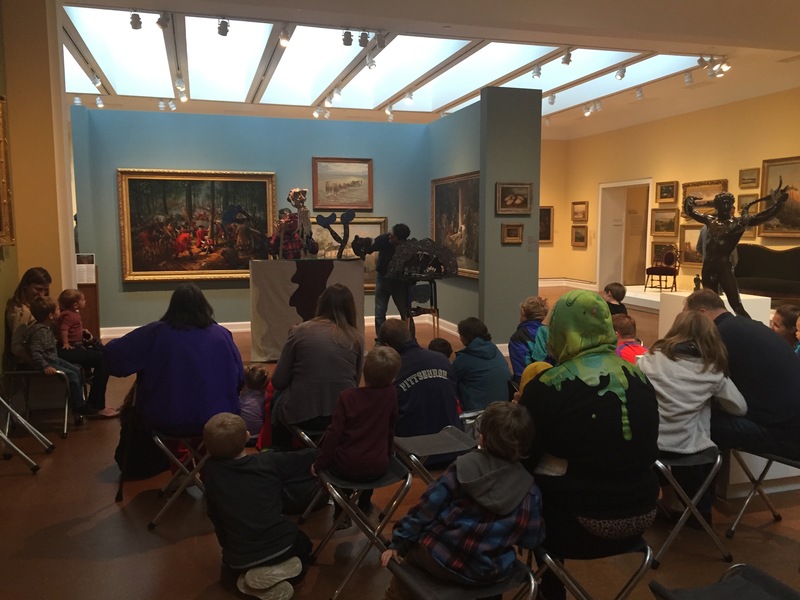 Shows happened in four separate galleries of the museum. 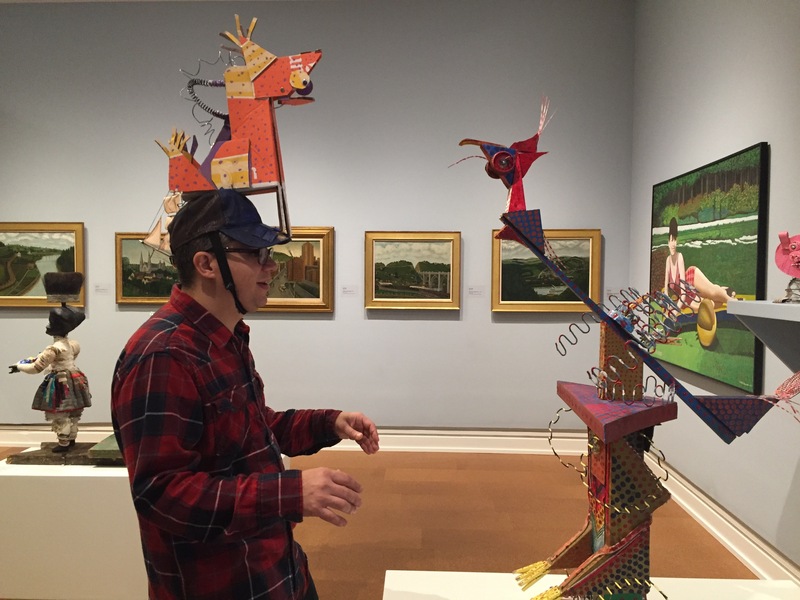 The first show reviewed the Irving story and imaged his famous character traveling to destinations pictured in museum works. The second show is set in a steel mill, with Van Winkle meeting the millworker Mike Kessel, pictured in a painting by Francis Komperda. The third work is inspired by the carnival paintings at the museum, specifically Carnival at the County Fair, by Dorothy Lauer Davids (1939). Puppets and set for the third piece featured carnival goers, carnival workers and a working wheel of fortune for audience members to spin. The final show happened in the ship-like cantilever wing of the museum. 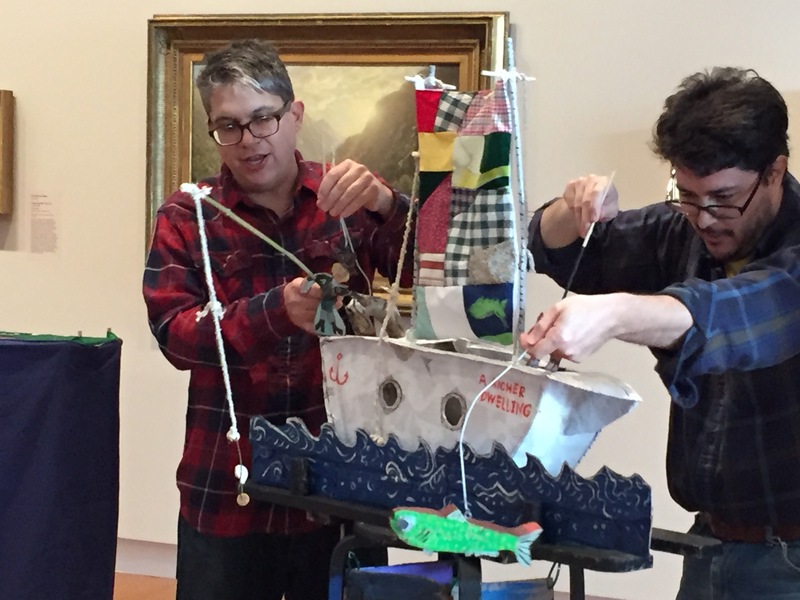 Titled A Nautical Adventure, it was a final furthering of the Van Winkle story, with Rip and his sidekick Cubby the dog setting setting sail for a journey of fishing and exploration. 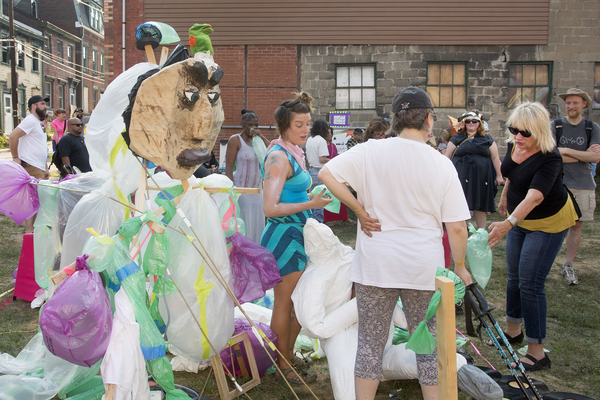 A carnival character inspired by the sculpture The Great Speckled Bird. 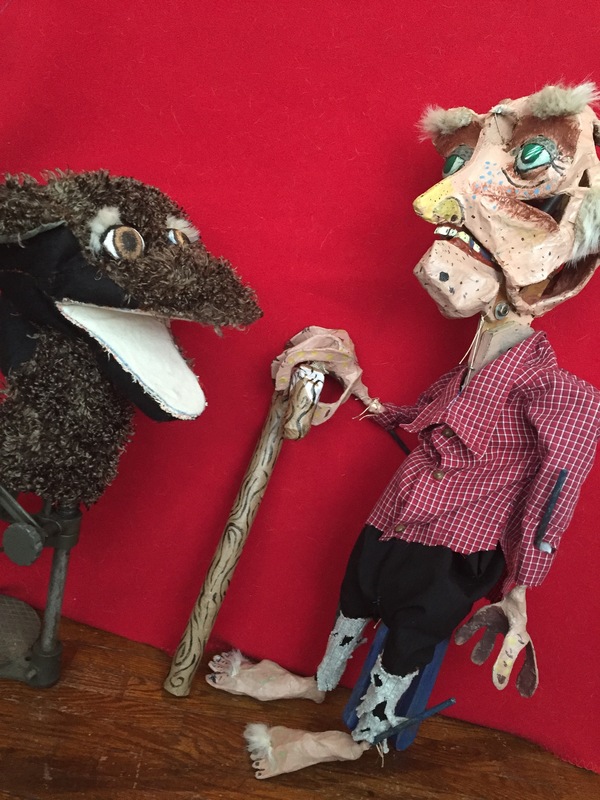 Rip Van Winkle and Cubby the dog puppets in progress. 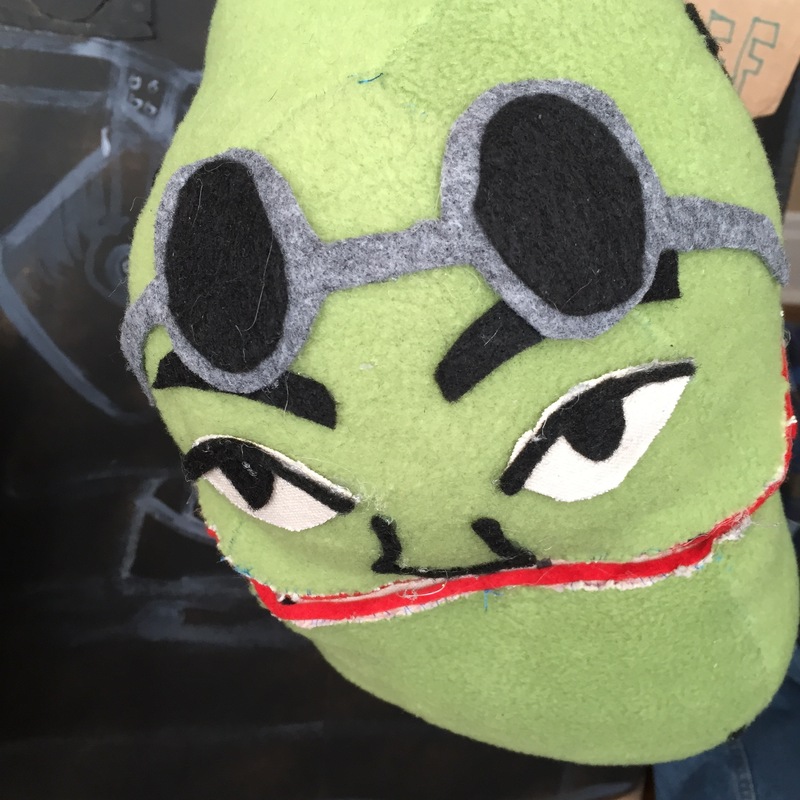 Van Winkle puppet snoozes next to a tree with his crazy quilt covering in Part 1. In Part 1, a toy theater scene features miniatures of the main characters. Steel mill setting for second puppet show. 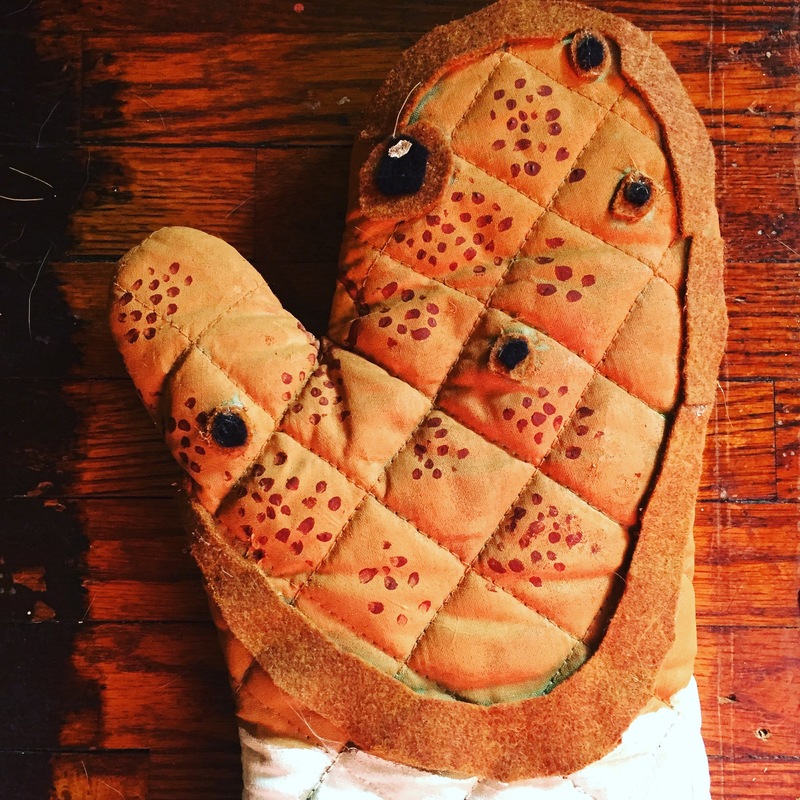 Hand puppet of steelworker Mike Kessel, operated by Mike Cuccaro. 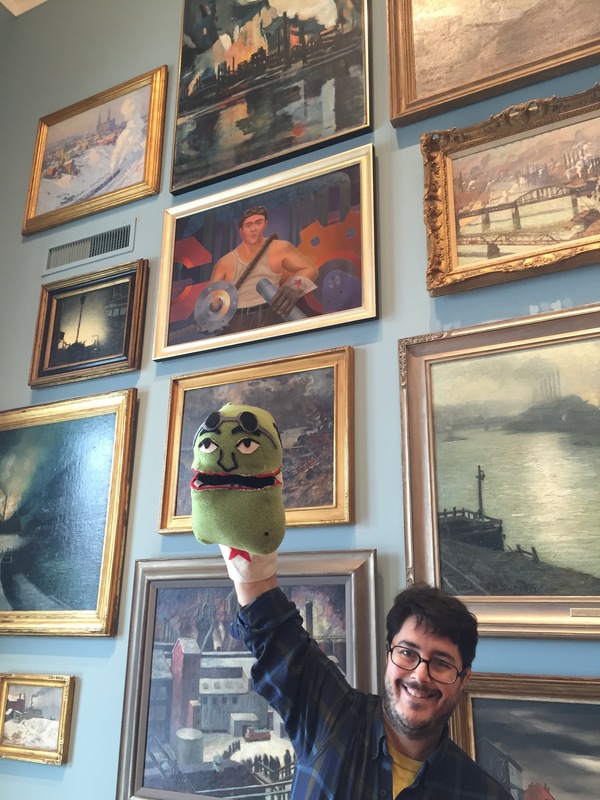 Mike Cuccaro with Mike Kessel puppet, under the Portrait of Mike Kessel. Rip visits a steel mill. A young baseball player at the carnival. Statue of Peace with the infant genius strolling at the carnival. The set for Carnival Time! Part 4, A Nautical Adventure. Rip’s dog Cubby retrieves his lost possessions, to be repurposed as a sail, ropes and tiller for a ship. 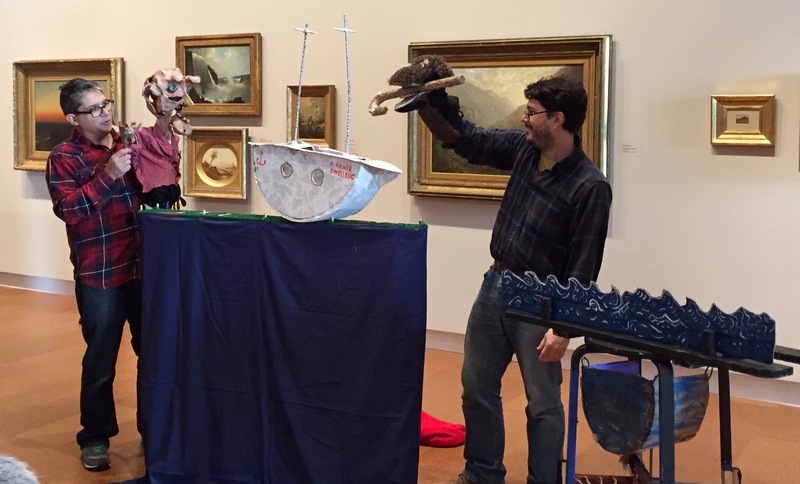 A toy theater scene in the final act of the puppet show. Rip and his dog set sail on a final adventure at sea. 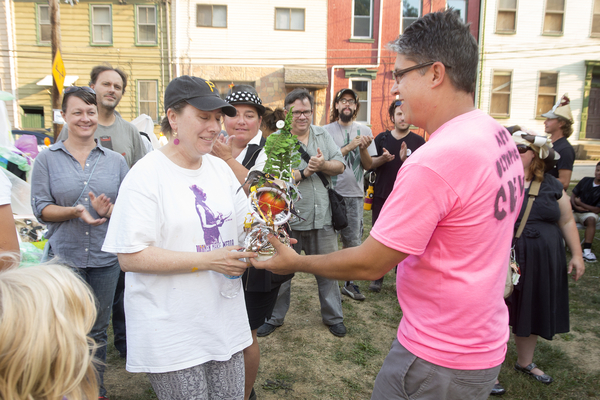 Here is a portfolio of images from the August 29th Art Olympic Festival by Pittsburgh photographer Larry Rippel. Images Copyright 2015. Julie Mallis, D.S. 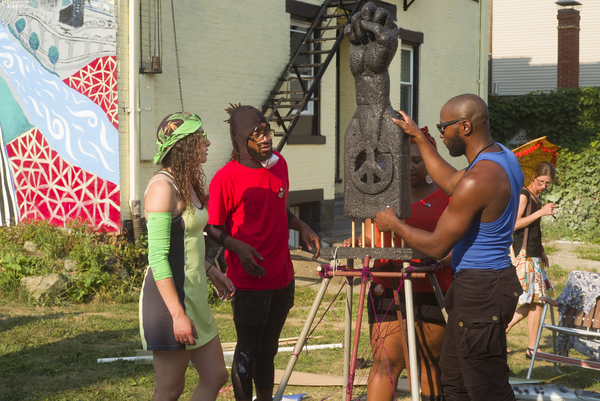 Kinsel, Anqwenique Wingfield and Daryl Collier of team Boom Concepts. 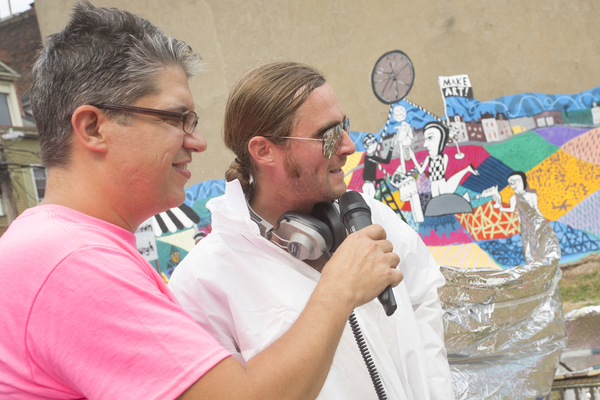 Craig Freeman and David Zak of the Commission for Cosmic Craft Transmission. 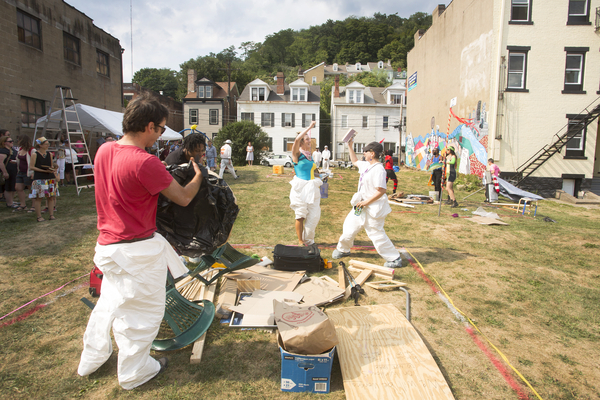 Before the show, piles of junk lay hidden under tarps. 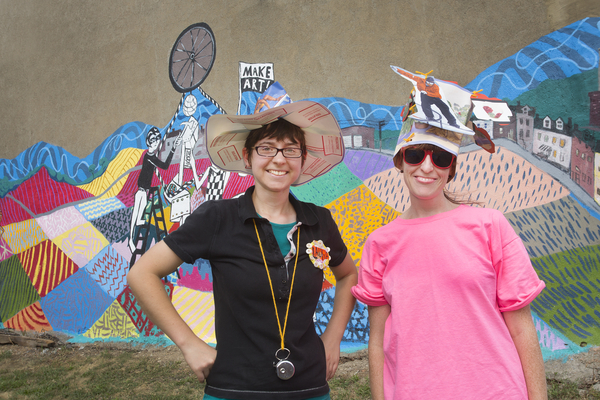 Laura Ramie from Pittsburgh Center for Creative Reuse and volunteer Amy Masters ran the hat making activity. 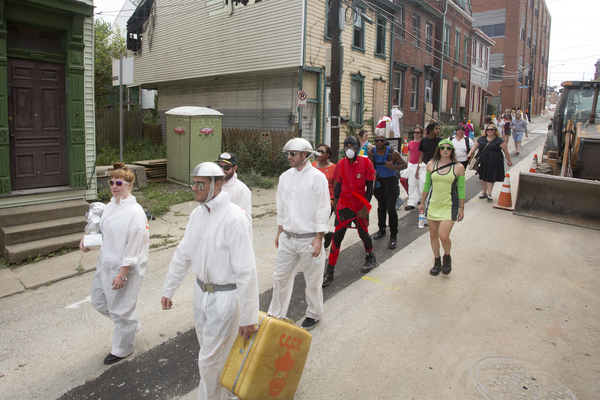 Teams parade from the Neu Kirche Contemporary Art Center to Art Olympic Field accompanied by Colonel Eagleburger’s Highstepping Goodtime Band. Team leader D.S. 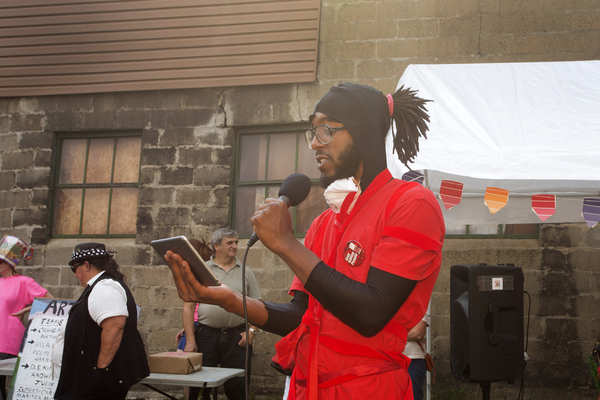 Kinsel delivers his artist statement. 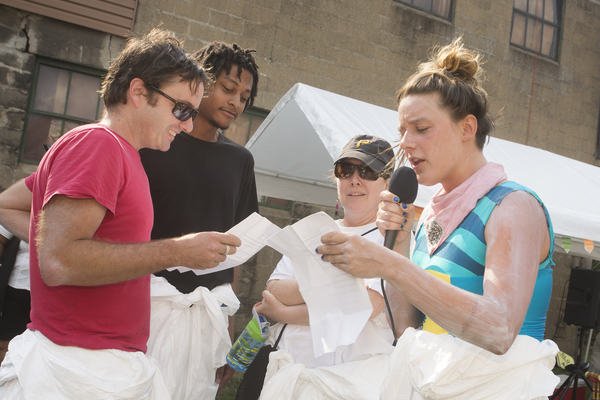 Felipe Garcia-Huidobro, Ryan A. Murray, Hyla Willis and Hannah G. Thompson deliver a team manifesto. 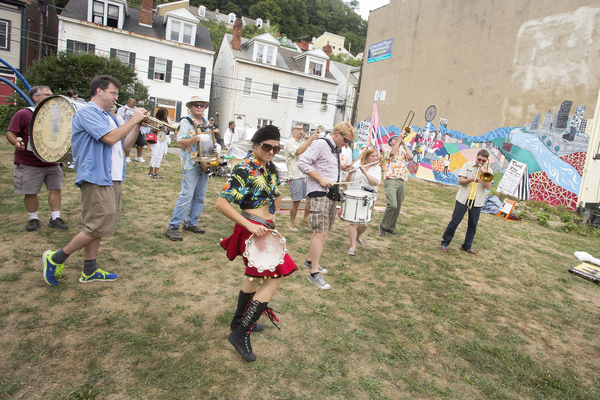 Colonel Eagleburger’s Highstepping Goodtime Band. Team Boom Concepts working outside the lines. Interviewing team leader Craig Freeman in the first round of the competition. 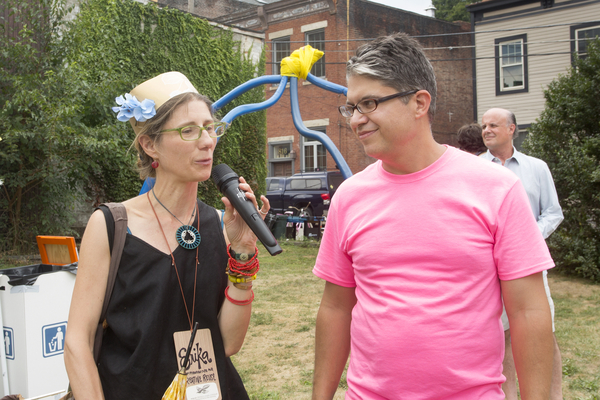 Judge Erika Johnson of Pittsburgh Center for Creative Reuse critiques the activity. 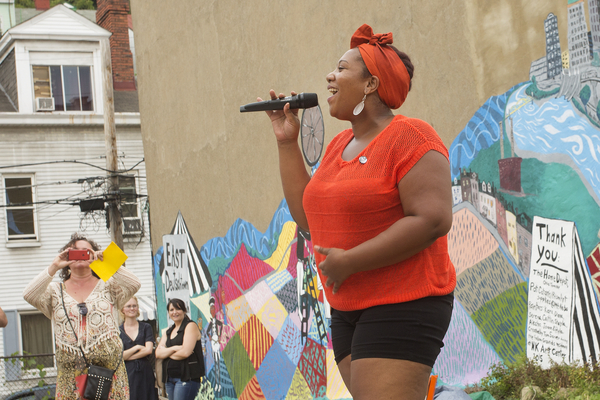 Anqwenique Wingfield with an operatic performance. Commission for Cosmic Craft Transmission prepares to send a signal into the cosmos. 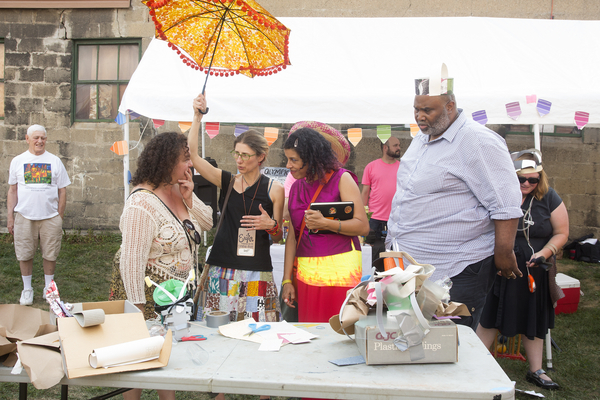 Visitors taking part in craft activities. 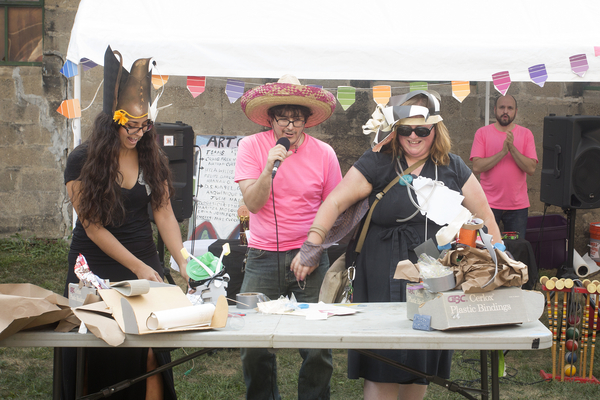 Mike Cuccaro moderates the “halftime show.” Two audience members had seven minutes to create sculptures out of the contents of small boxes. 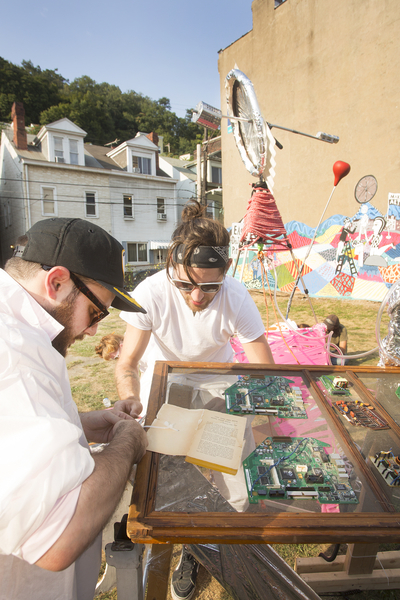 Boxes were filled with random items from Pittsburgh Center for Creative Reuse. Judges Maritza Mosquera, Erika Johnson, Christiane D, and Wayne Younger debate the winner of the halftime show. 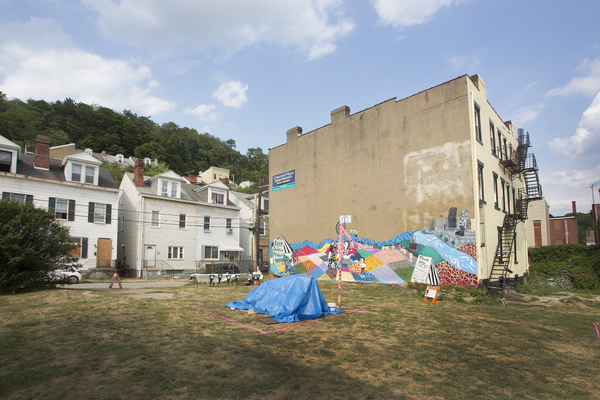 The Art Olympic Festival took place in a rare patch of green space in the East Deutschtown neighborhood of Pittsburgh. 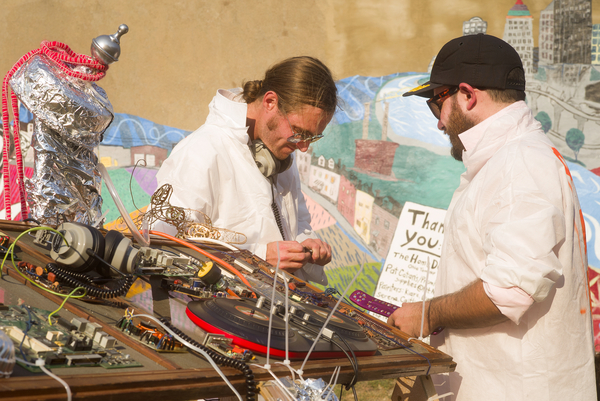 David Zak and Nathan Curtis working meticulously to use all of their provided junk items. 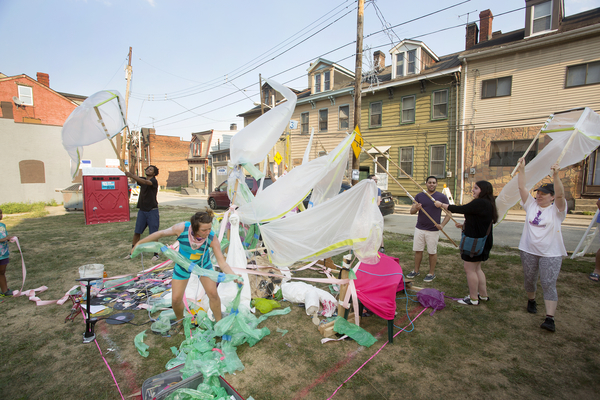 Led by artist Hyla Willis, team Puff and Stuff invited audience members into the square to assist in creating inflated plastic bag forms. 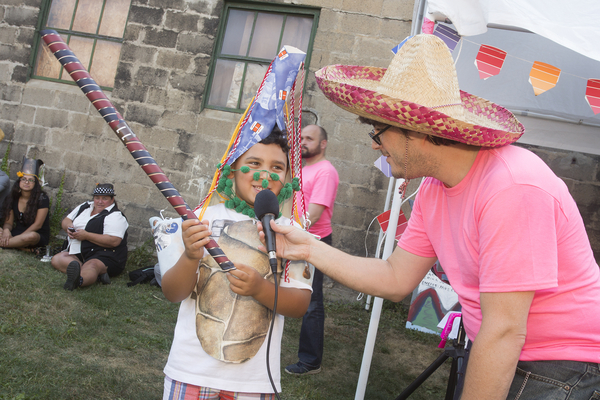 Mike Cuccaro interviews a young audience member. Team Puff and Stuff in action! Commission for Cosmic Craft Transmission in action! Judges making final comments on the show. Team Boom Concepts after their final presentation. Hyla Willis accepting the second place trophy. It was a very close contest! 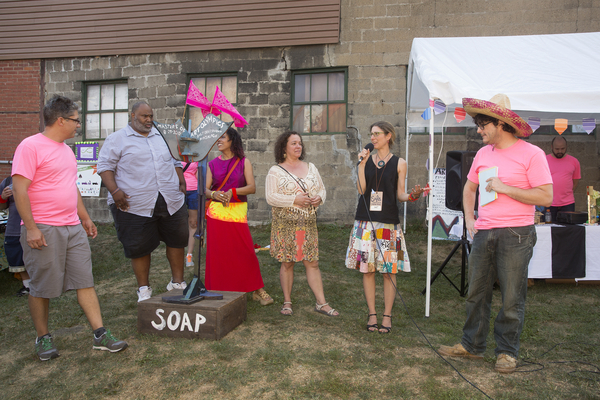 Nathan Curtis, Craig Freeman, Elizabeth Rudnick and David Zak – winners of the 2015 Art Olympics. 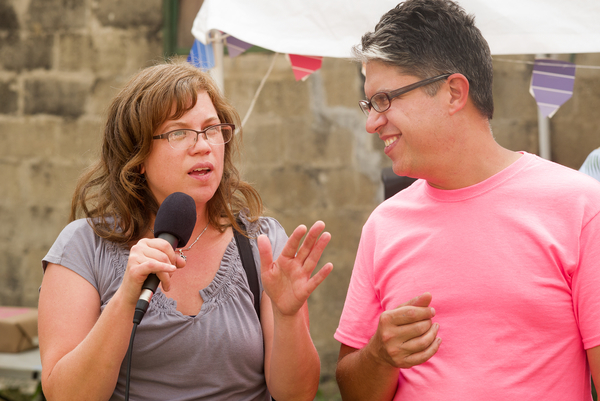 Comments from Liz Hammond, Emcee, musician and crew member of the 2007 and 2008 Art Olympics. Finishing touches by Nathan Curtis. 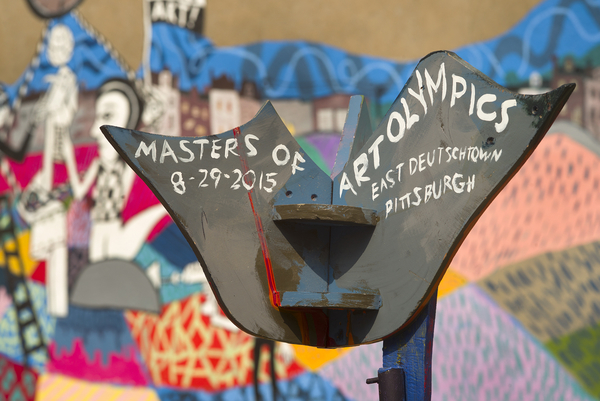 I’m in the process of planning an Art Olympic Festival to take place on Saturday, August 29th 2015 on the North Side of Pittsburgh. 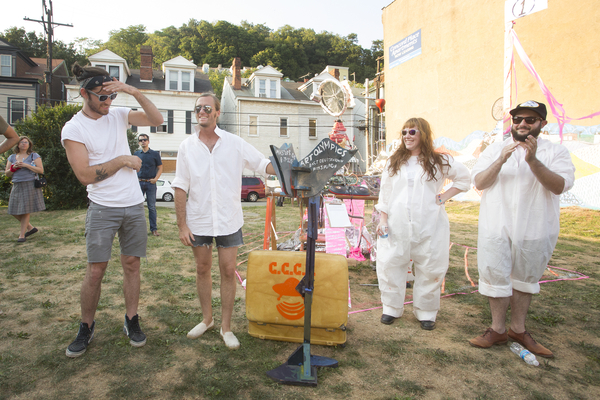 The event, a contest inspired by the Iron Chef TV show, features three teams of artists competing over three hours to make winning sculptures out of piles of junk. 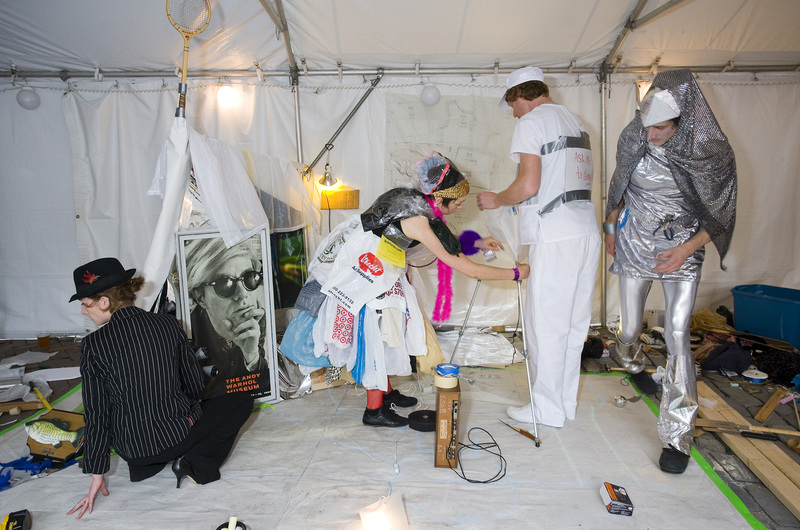 Teams are judged in categories such as “creative use of materials and best performance.” The highly interactive event allows audience members to get up close and see the work in progress. Visitors are welcome to make commentary on the show, and to participate in a “half-time show” competition. 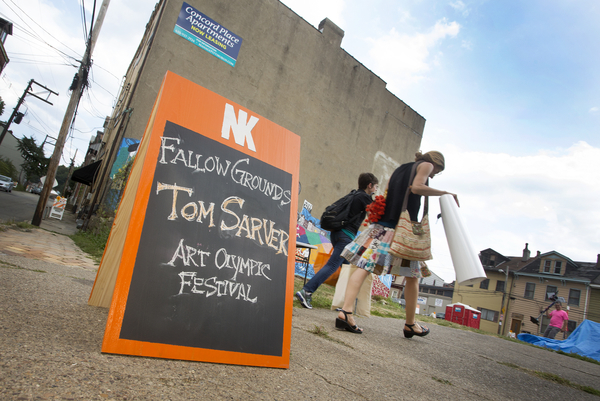 The August 29th event will by hosted by the Neu Kirche Contemporary Art Center as part of their Fallow Grounds artist residency series. Festivities are scheduled to begin at 4 PM and run until 6:30 PM. 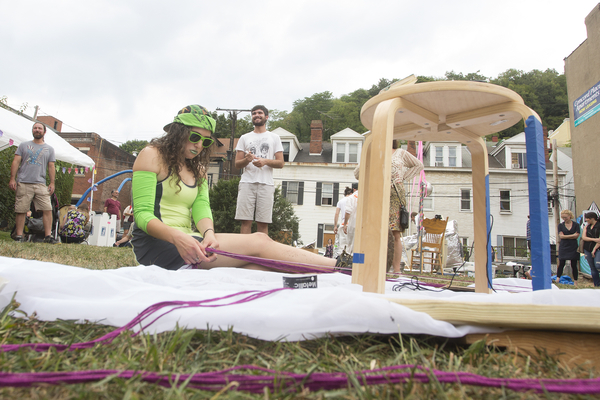 The event, located at an empty lot near the Neu Kirche Center, is free and open to the public. 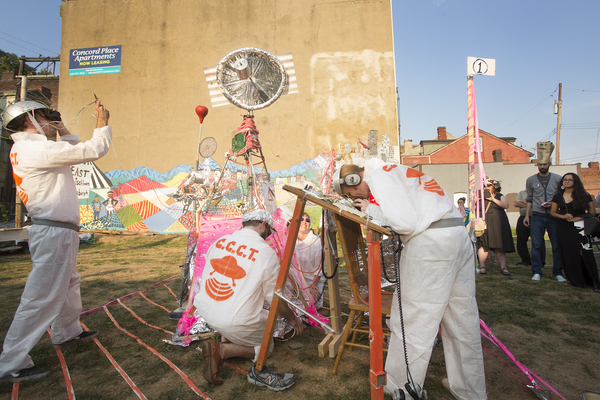 Previous Art Olympic main event shows have happened at the Mattress Factory, The Union Project, the New Hazlett Theater, and Market Square. Shorter, table top events have taken place at the August Wilson Center and Pittsburgh Center for the Arts. 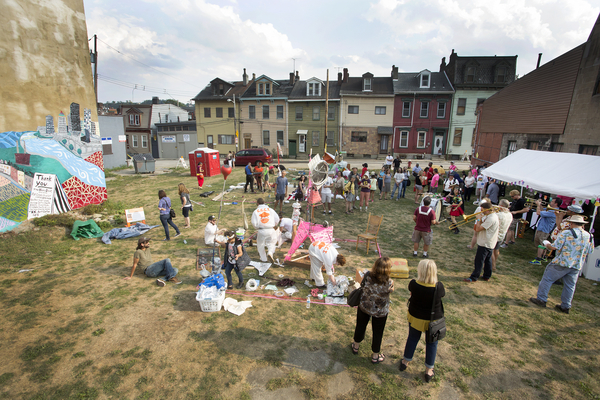 In 2008, Art Olympics at Market Square was a main event of the Three Rivers Arts Festival, Pittsburgh. Photo by Larry Rippel. 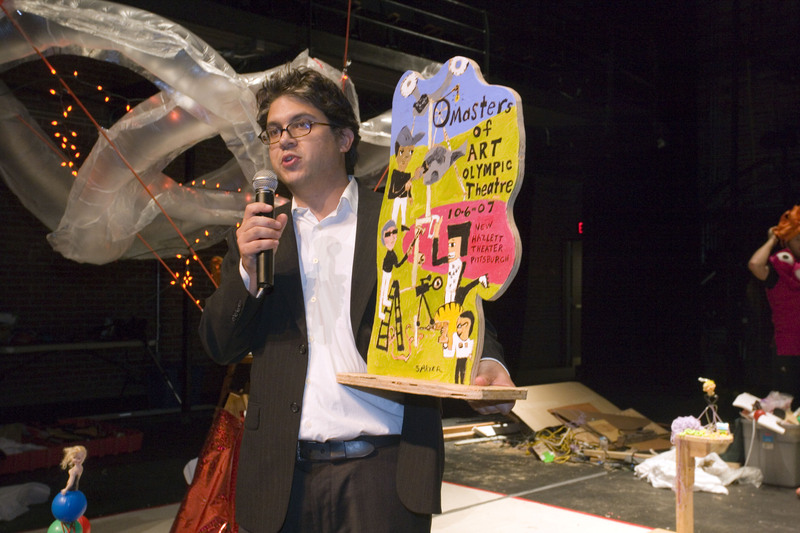 2007 event at the New Hazlett Theater (with Art Olympic Trophy). 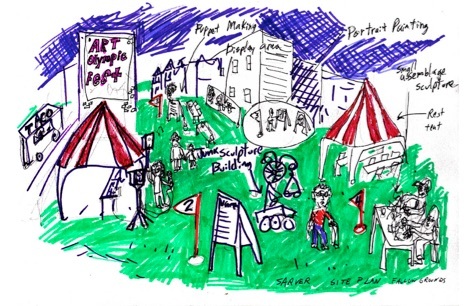 Sketch for the Art Olympic Fest, Fallow Grounds Residency at Neu Kirche Art Center. Here are three kinetic pieces that I recently made and shipped out to Brooklyn for a small works show (set to take place during the 2015 Bushwick open studios). 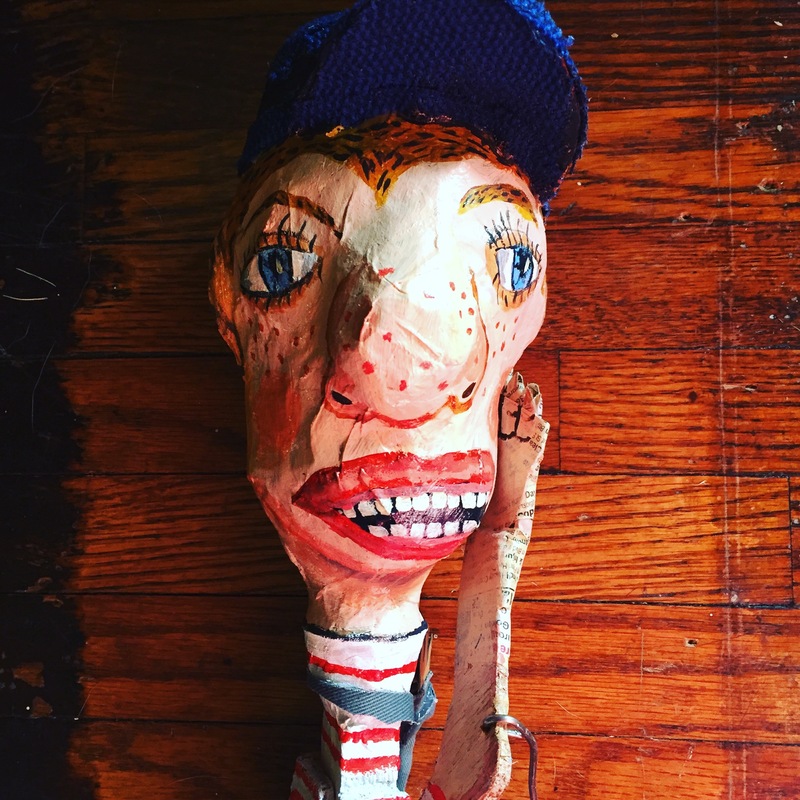 The Tiny Art Show (organized by NY artist Mary Ivy Martin) is taking place at 114 Forrest Street, Studio 4A. 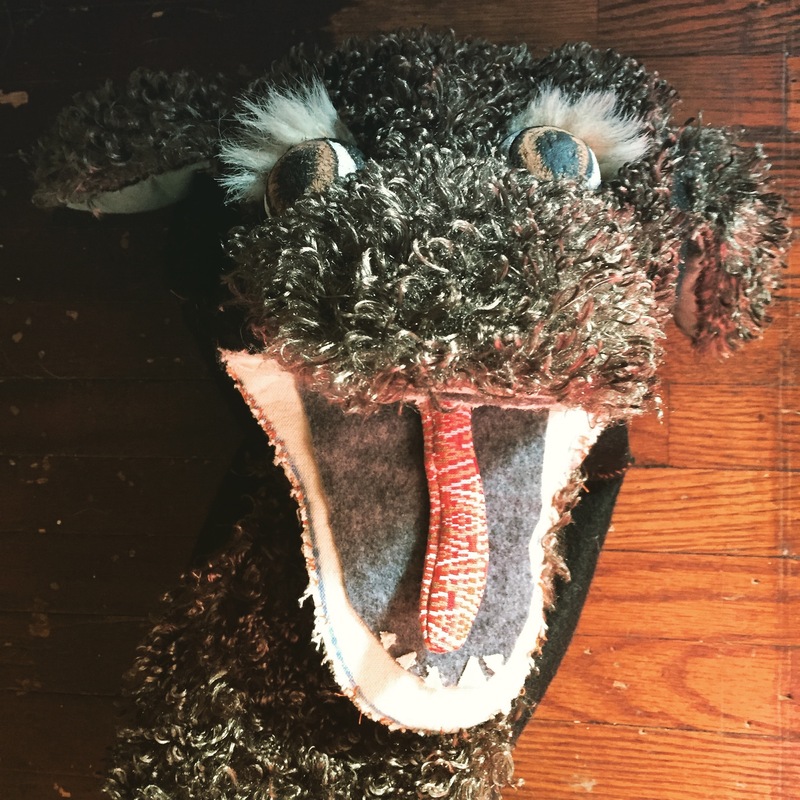 Show times are: Friday, June 5, 7 PM – 9 PM, Saturday June 6, Noon – 7 PM and Sunday, June 7, Noon – 7 PM. Open Up and Say Ah! Found object assemblage, 2015. 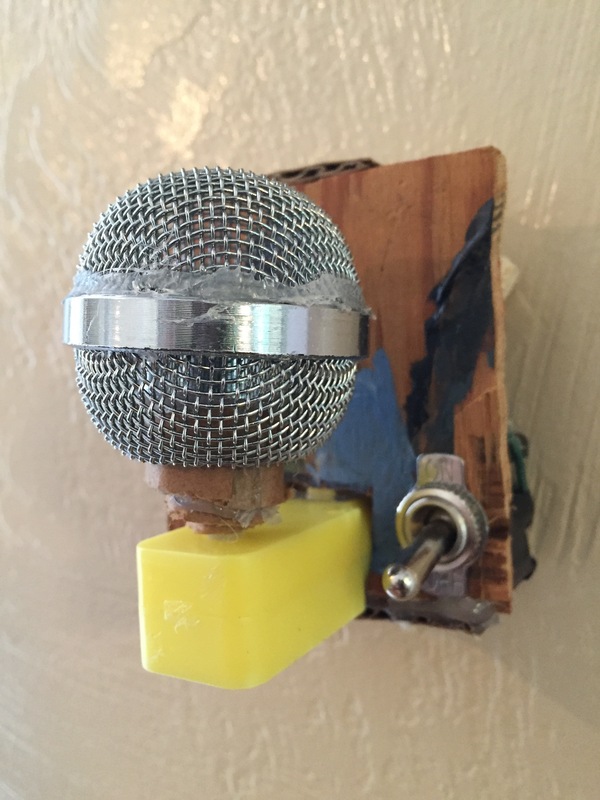 (This piece has a sound sensor that triggers a light when one yells at the work. This is my spin on Robert Gober’s Carnegie Museum of Art drain piece).